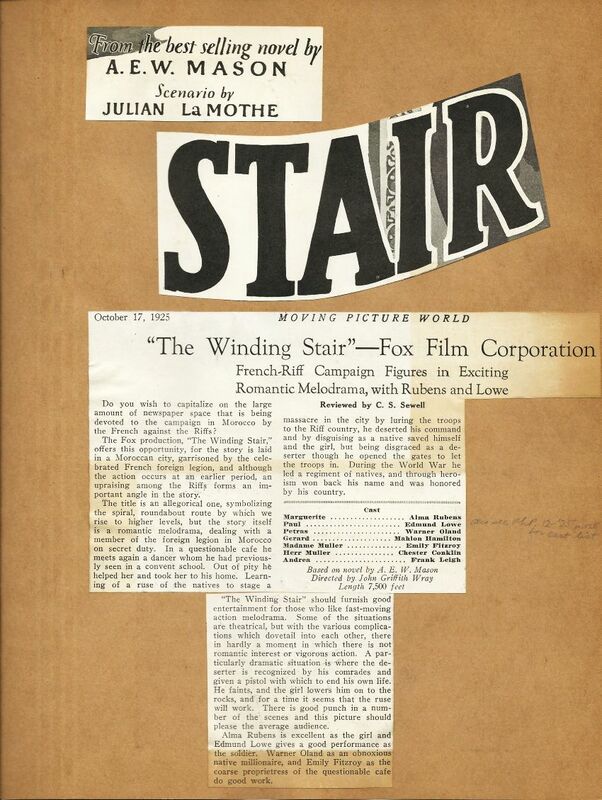 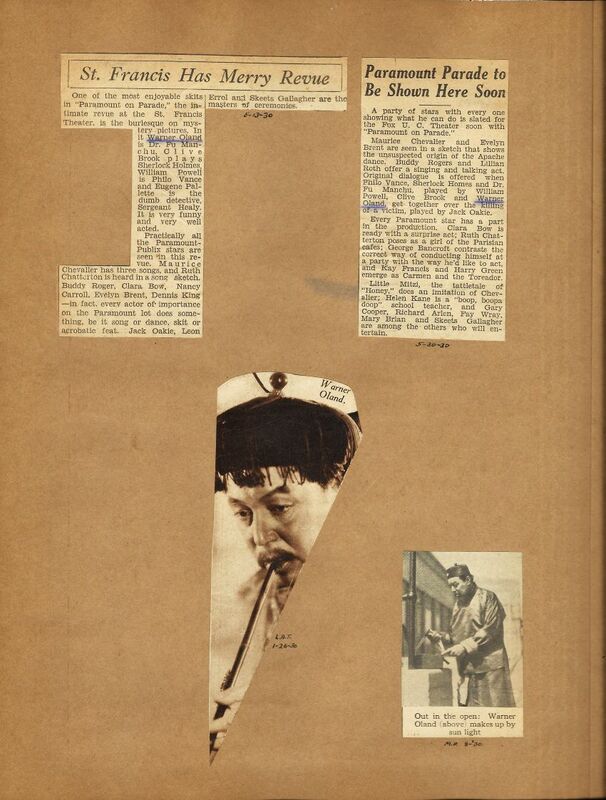 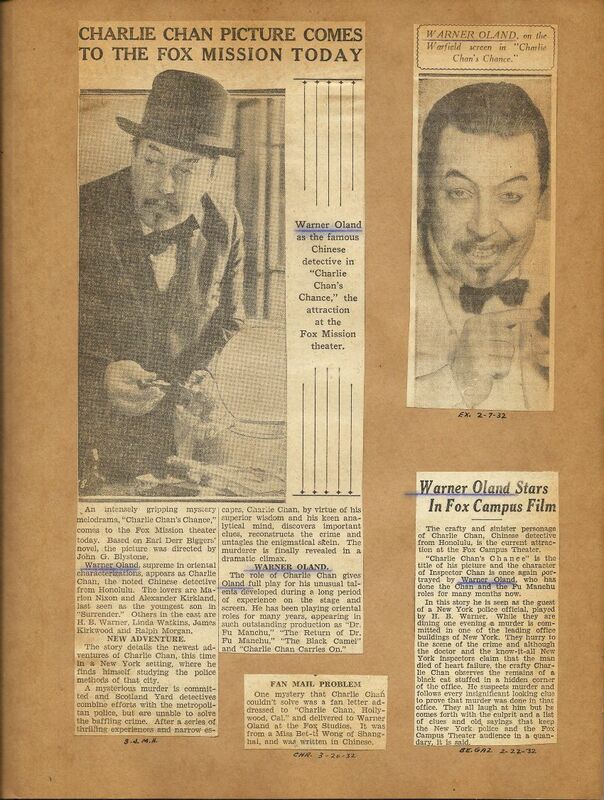 Presented here for your enjoyment and edification is a 142-page scrap book that contains a multitude of rare often esoteric newspaper, magazine, and trade paper clippings that were meticulously collected, pasted, and documented, all focusing on Warner Oland. 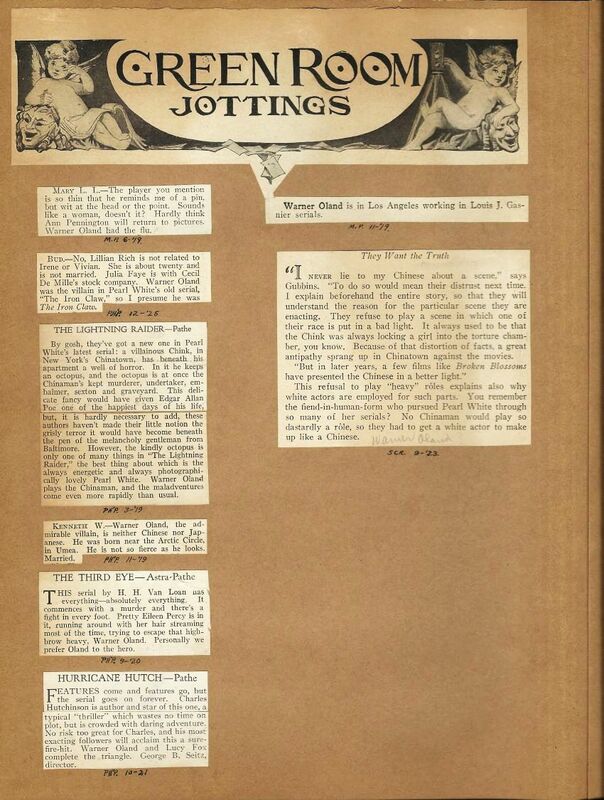 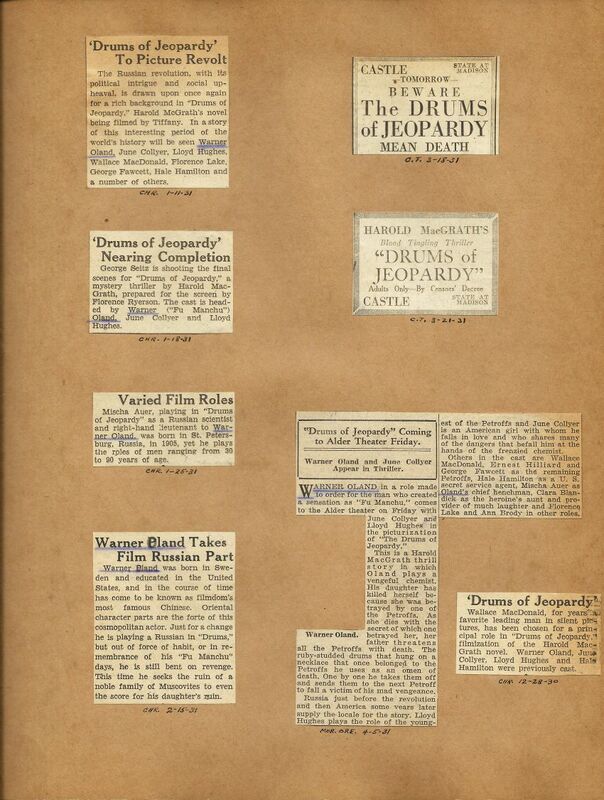 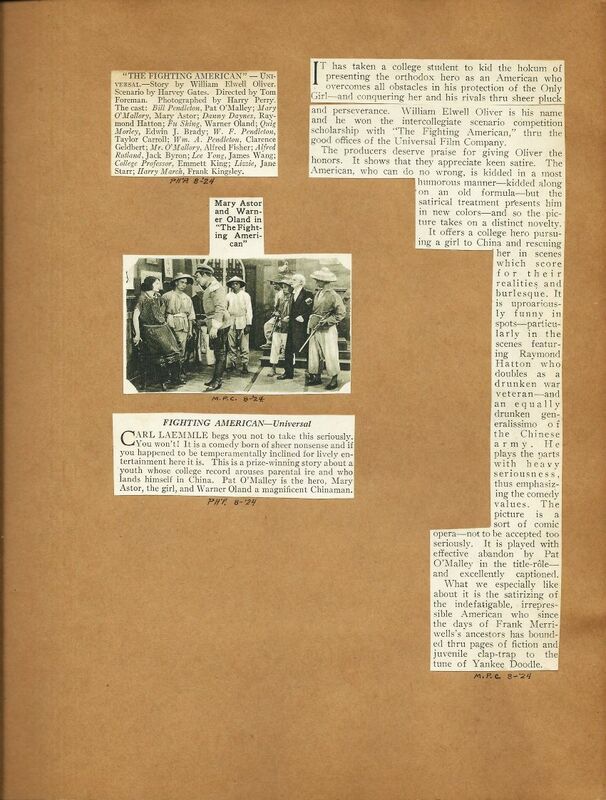 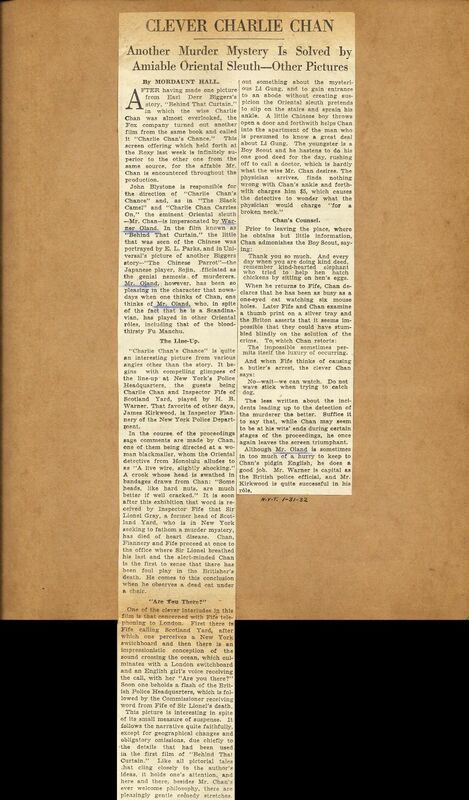 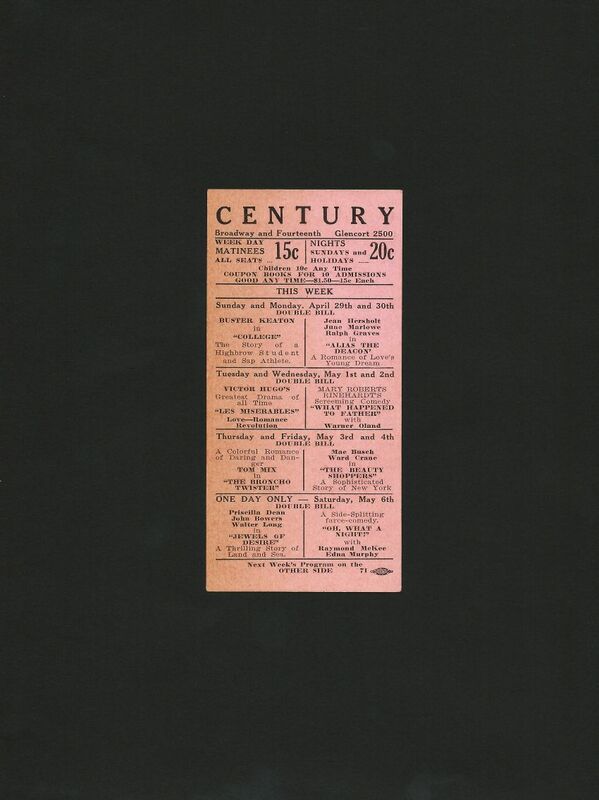 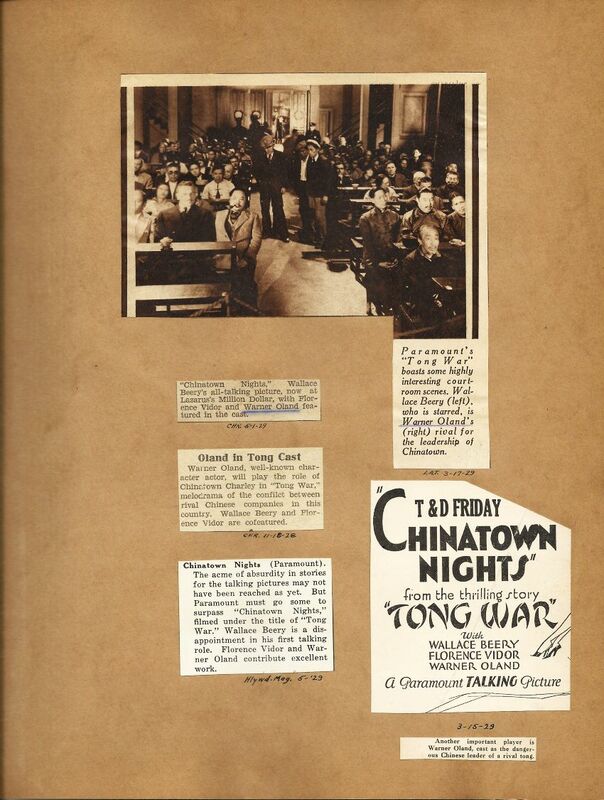 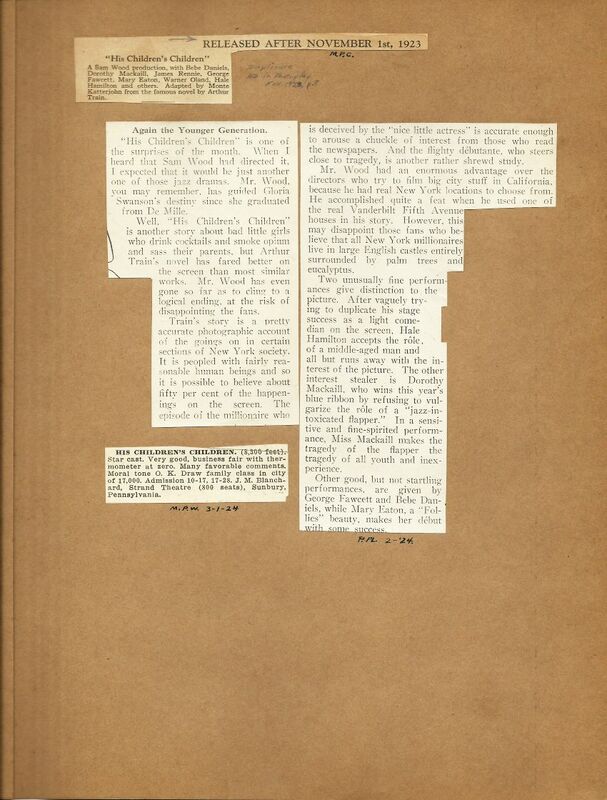 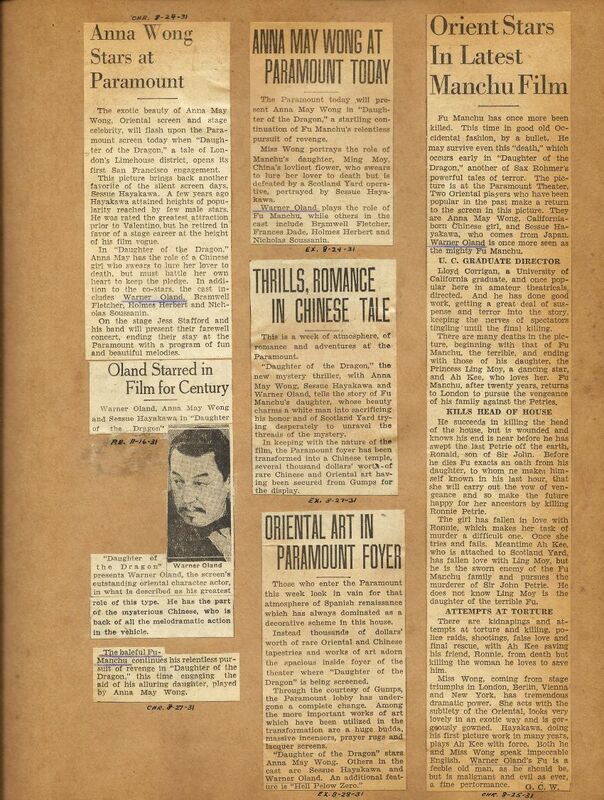 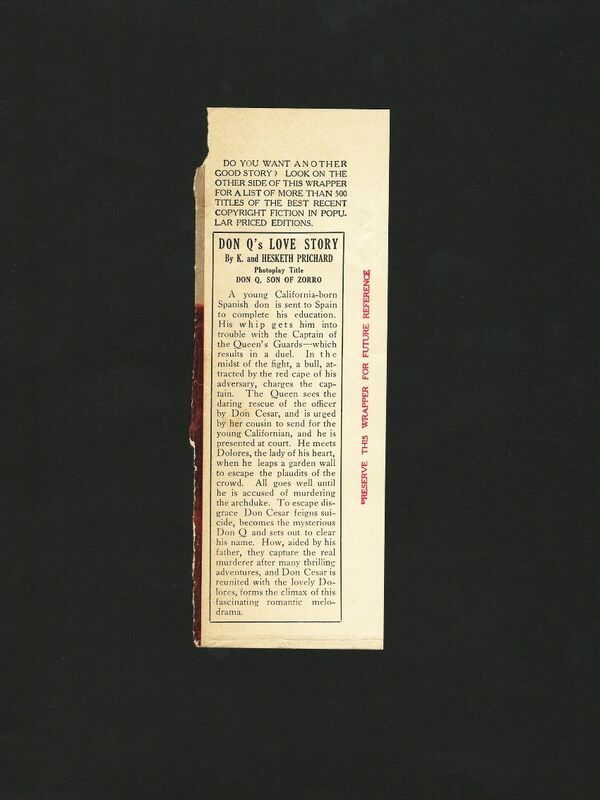 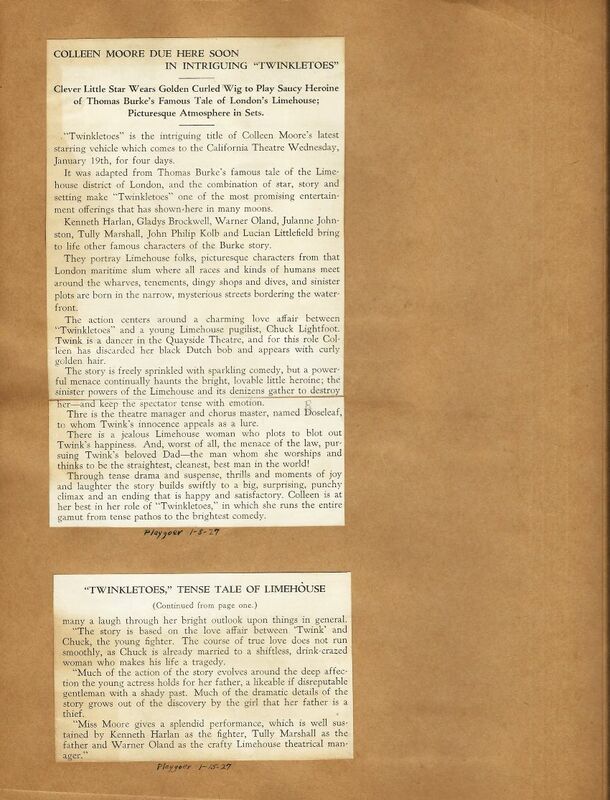 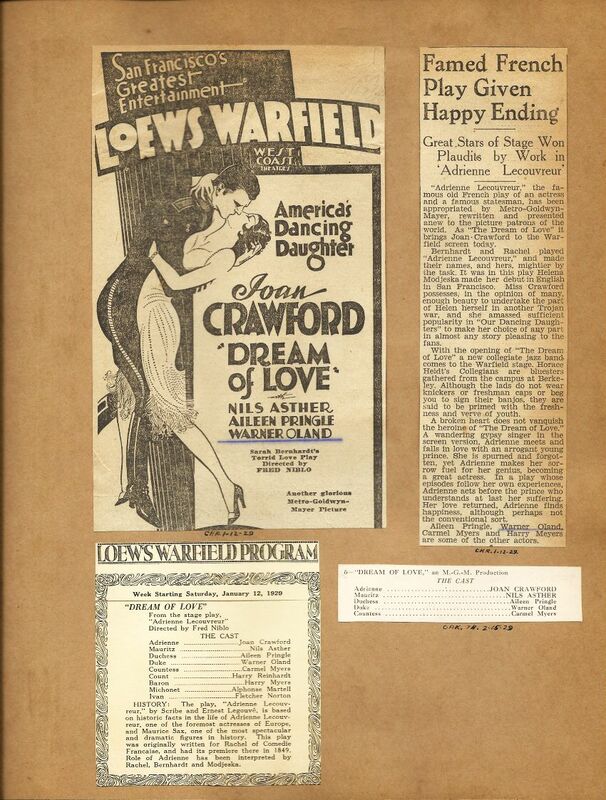 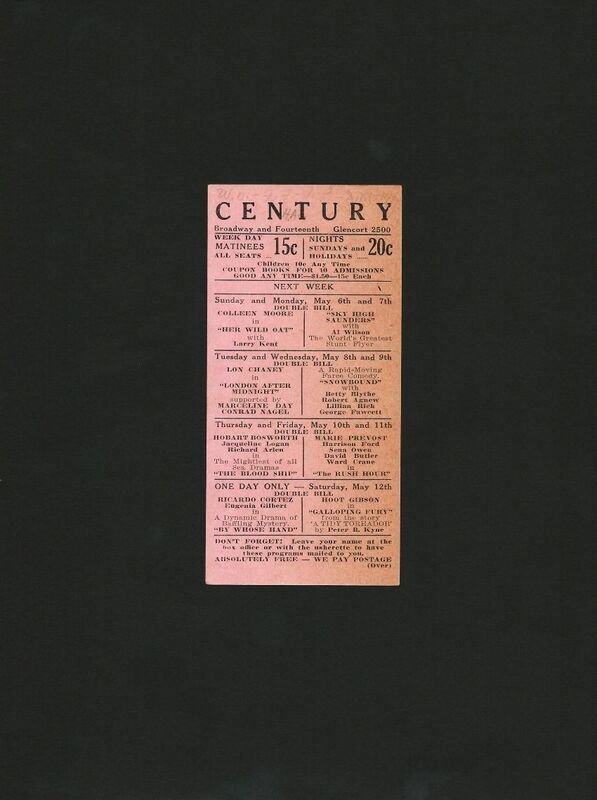 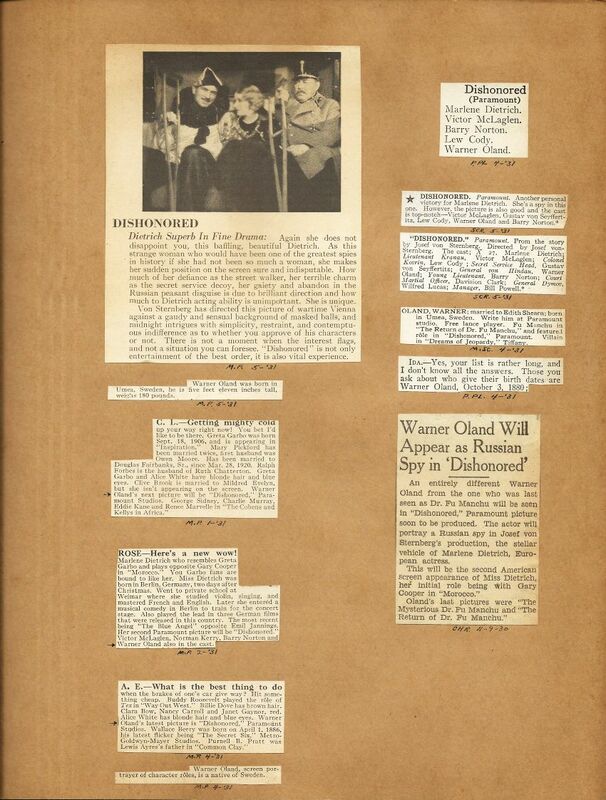 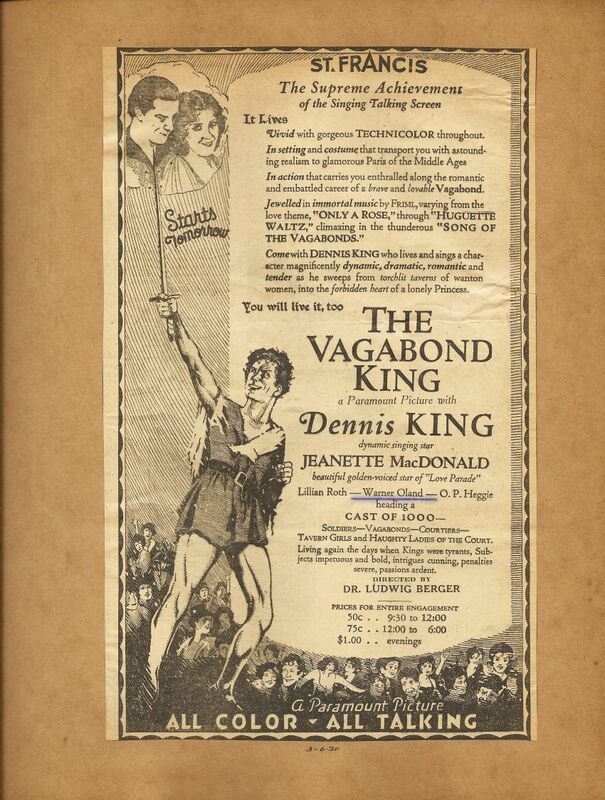 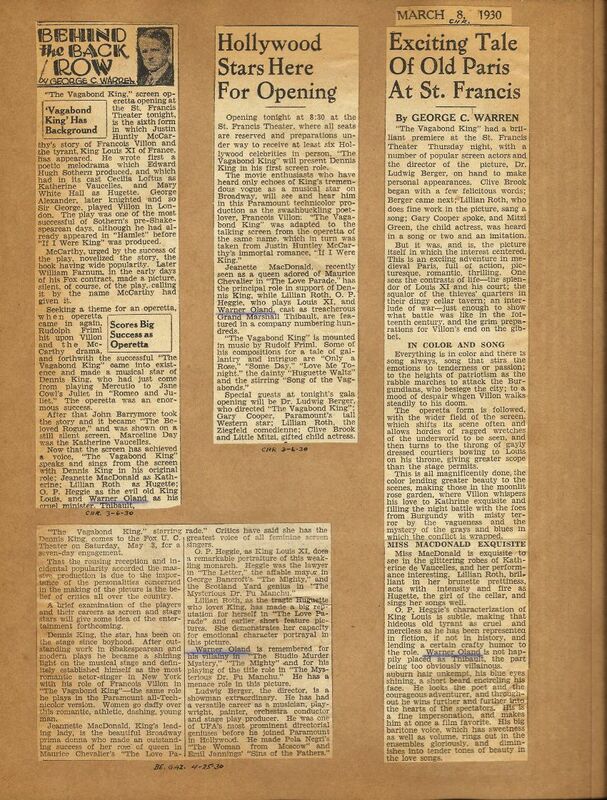 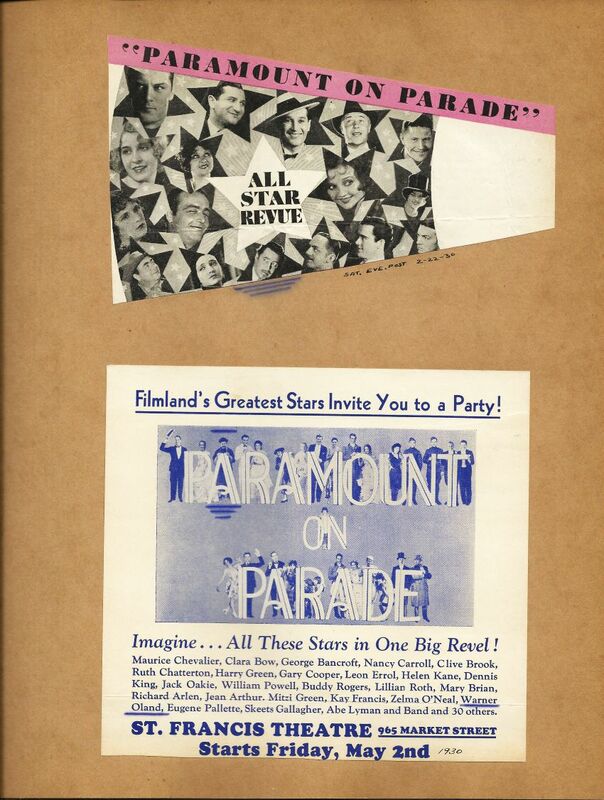 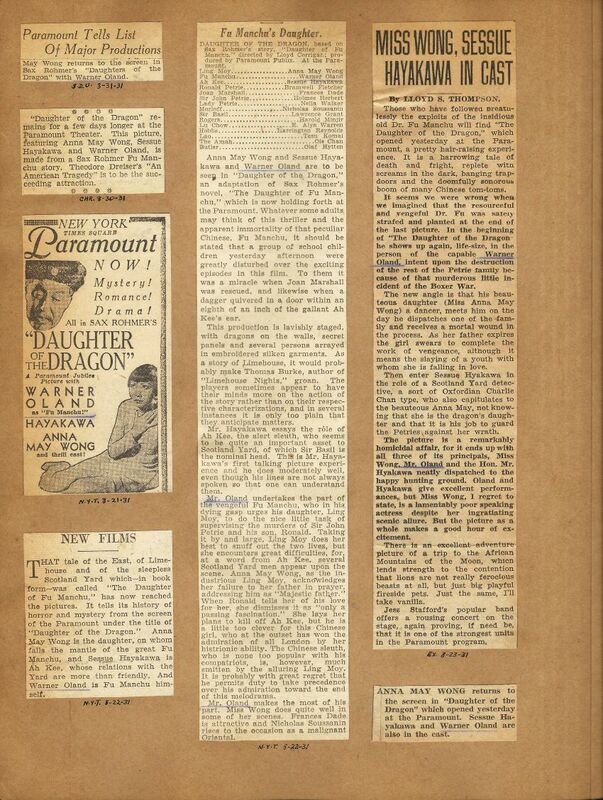 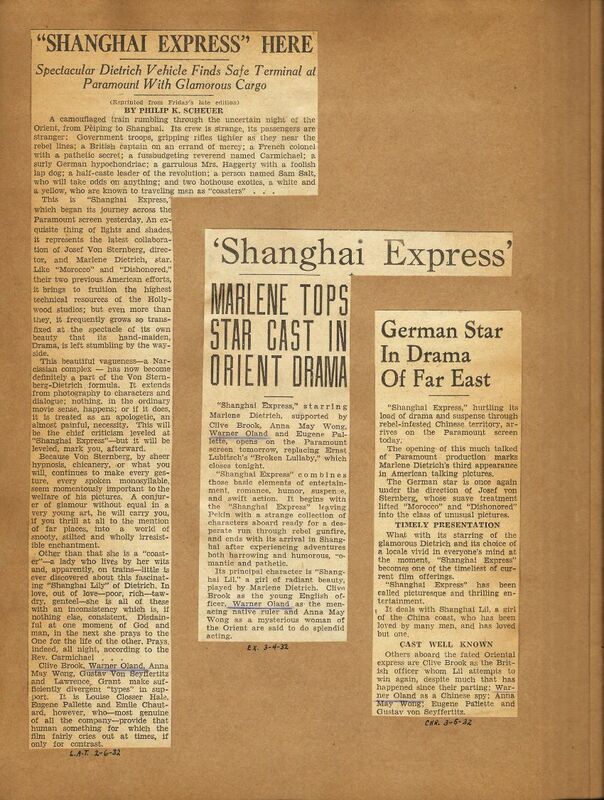 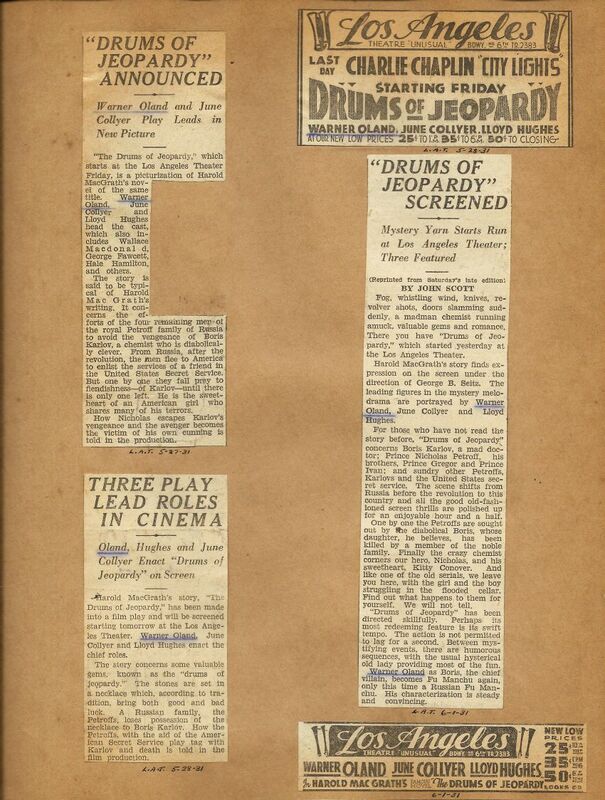 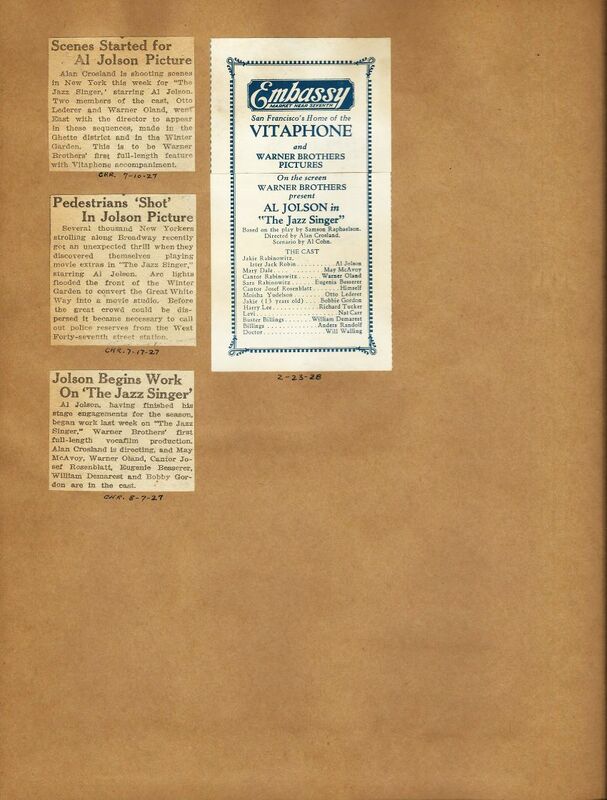 The clippings date from February 25, 1916 and run through March 5, 1932 – 16 years' worth of material! 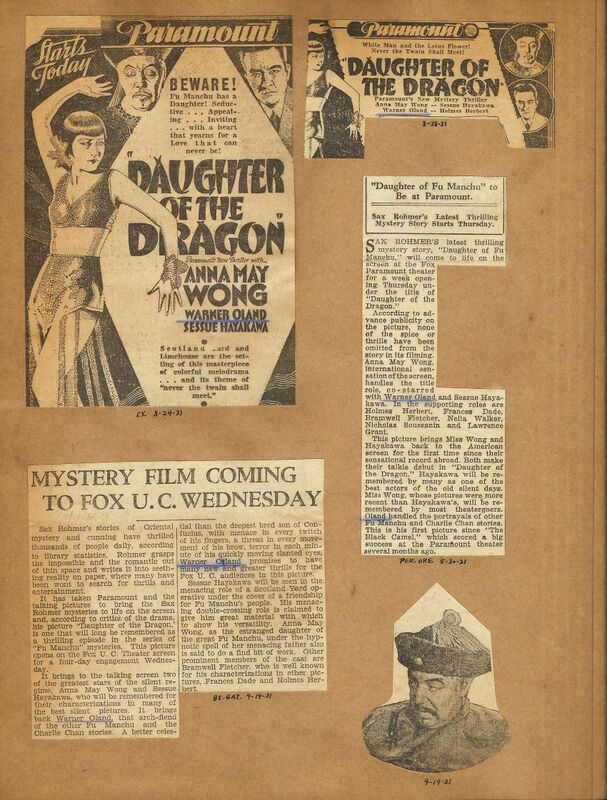 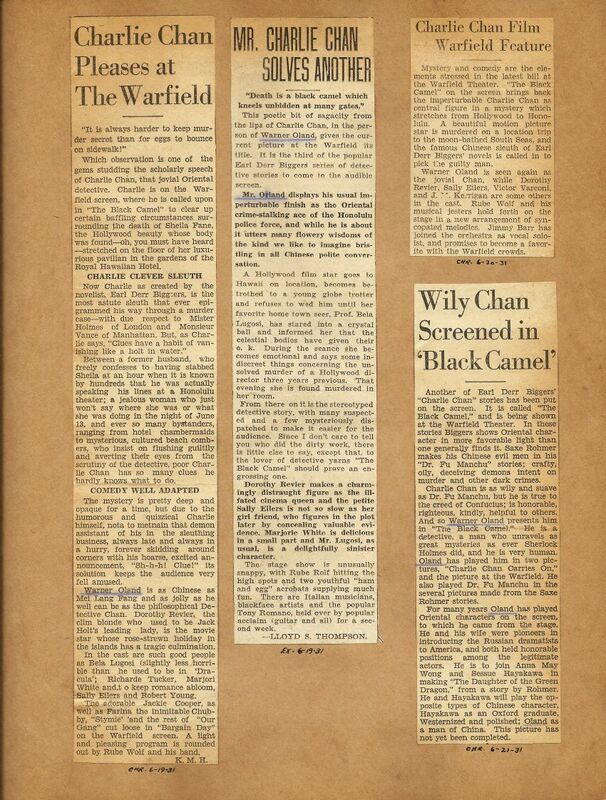 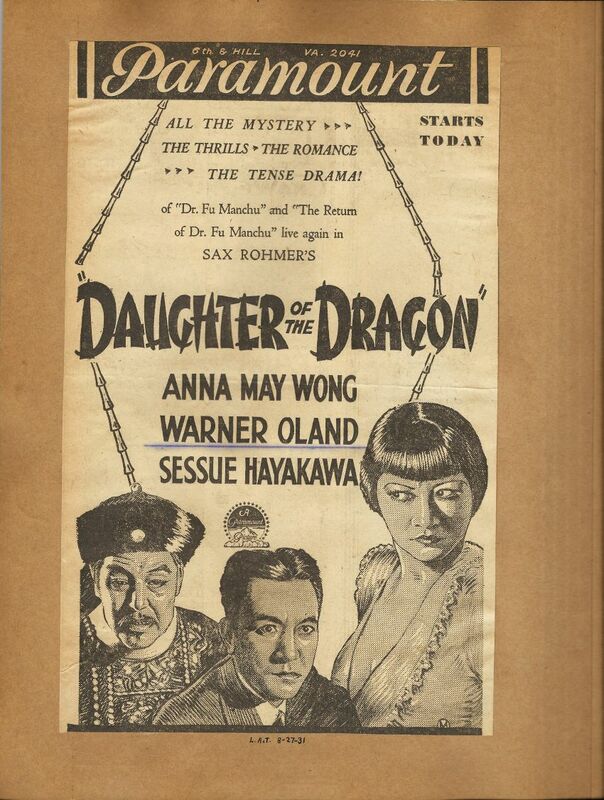 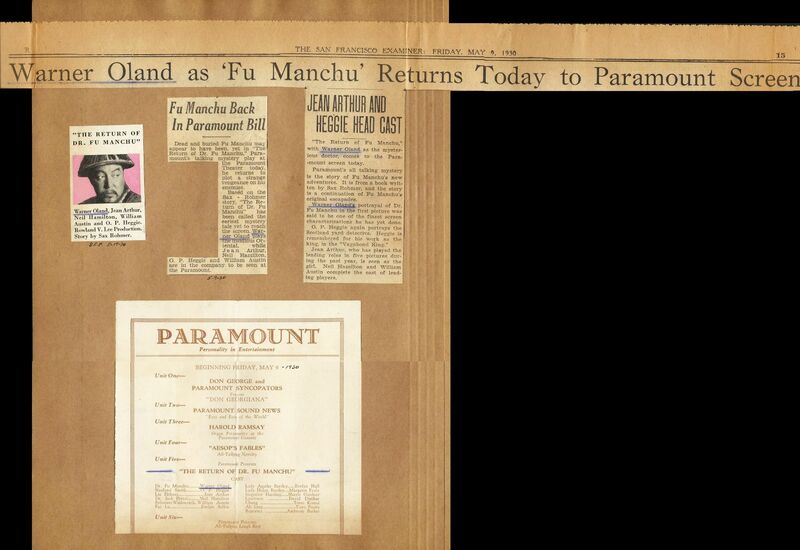 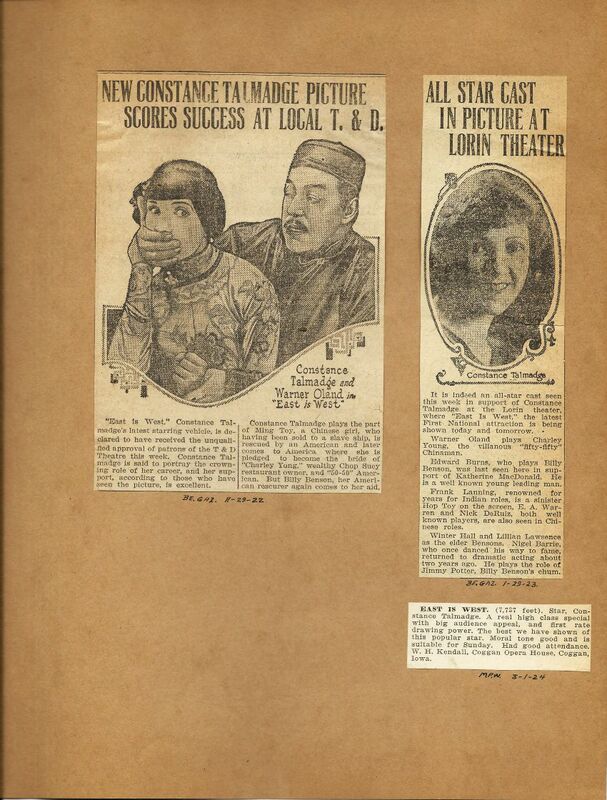 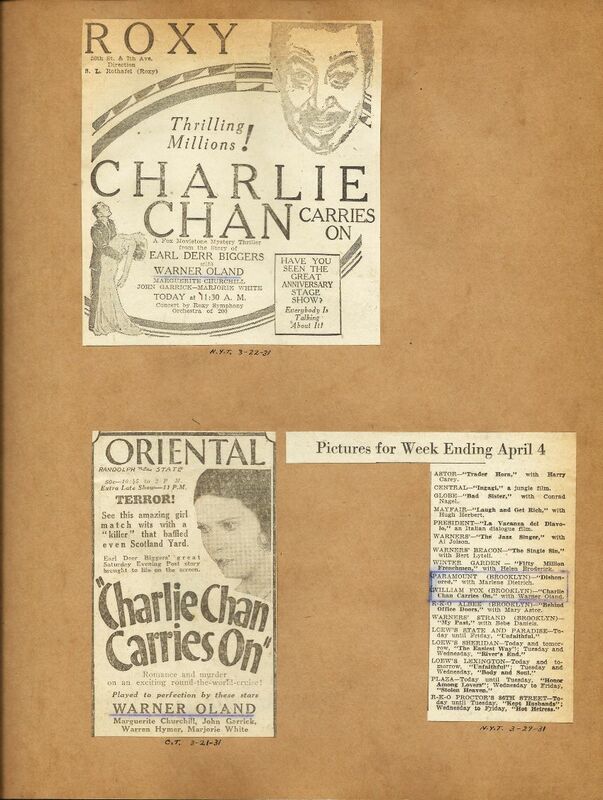 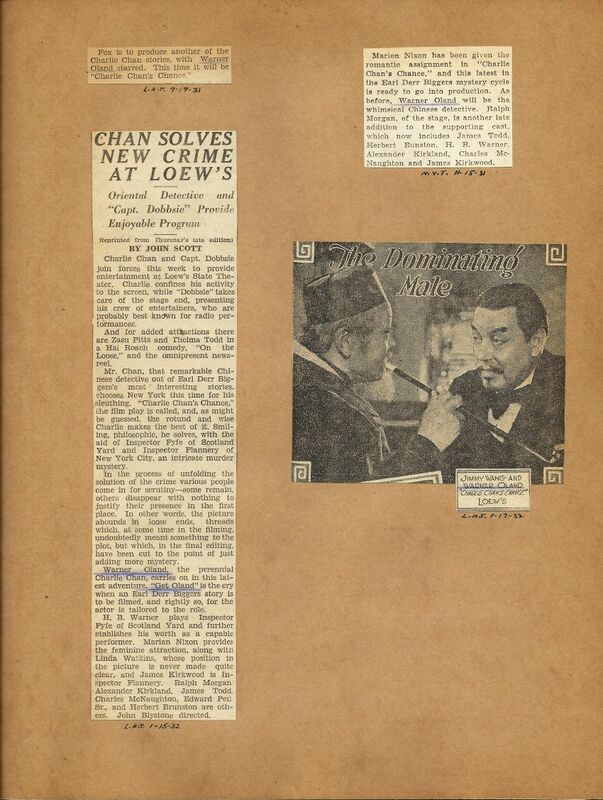 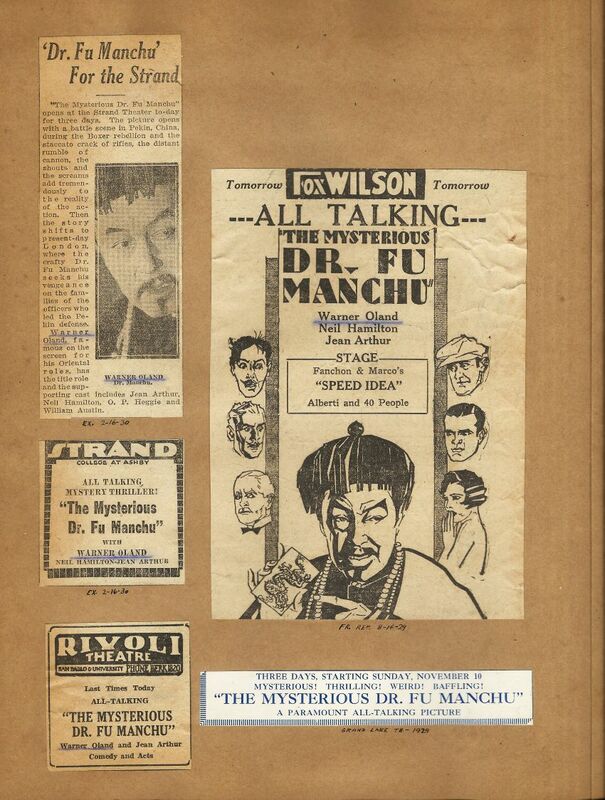 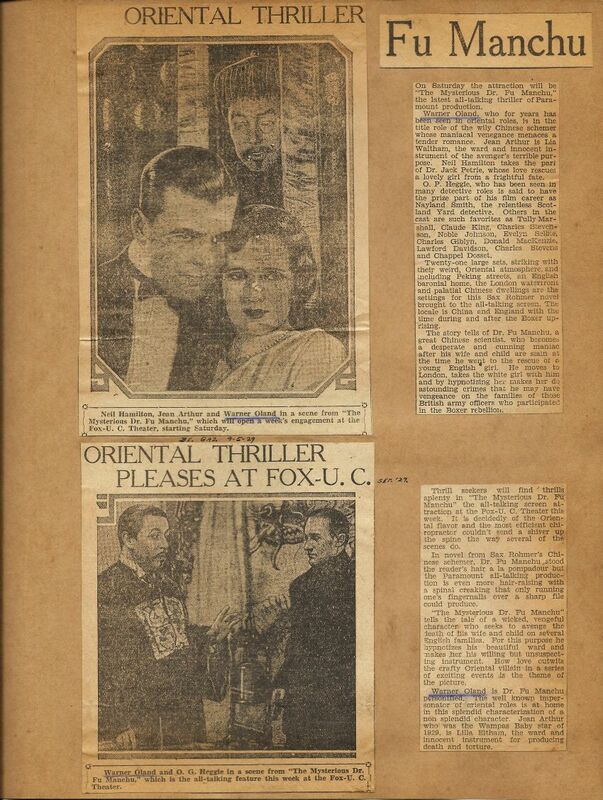 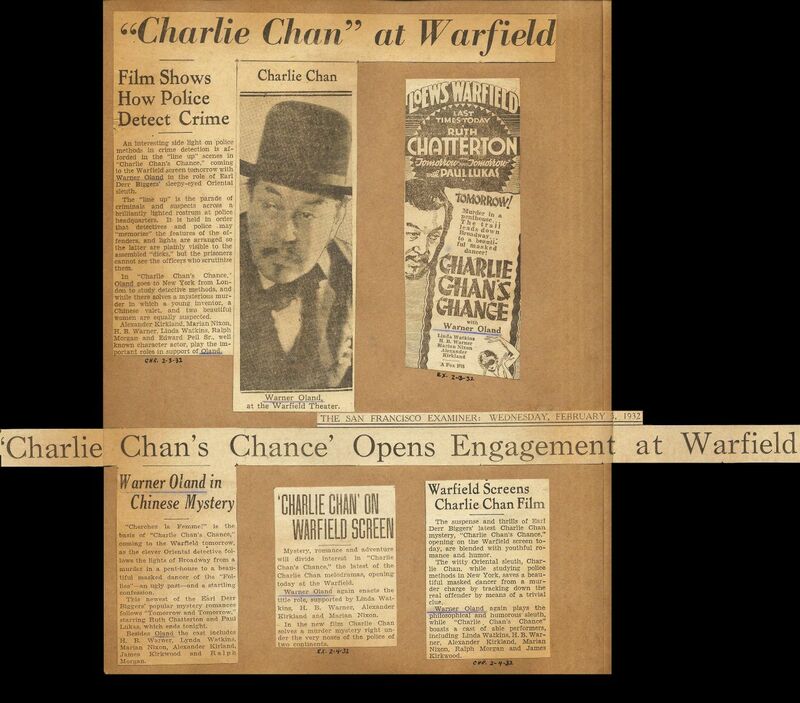 We are presented with Oland's earliest roles in silent films of the 'teens, moving into the 'twenties, and finally into the first years of Charlie Chan era in the early 1930s. 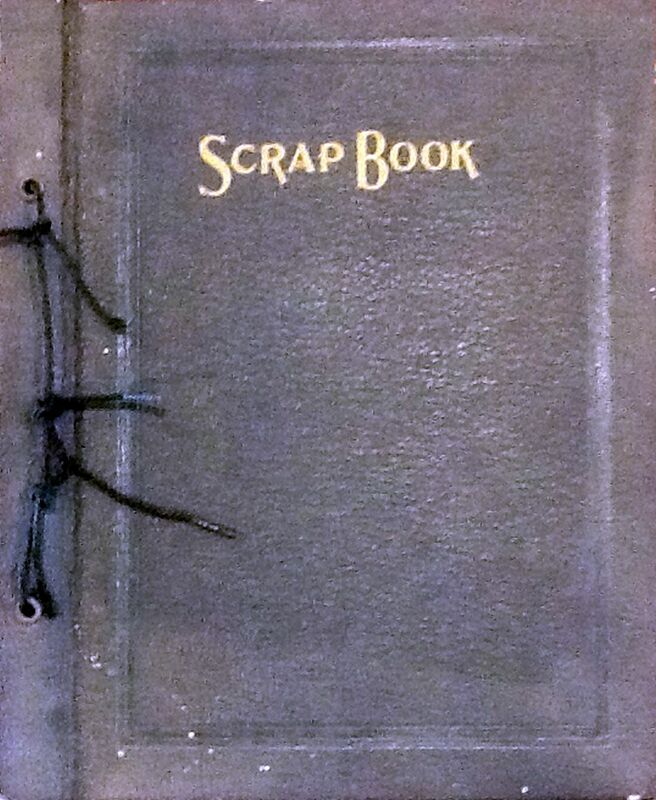 We may surmise that somewhere there exists another such scrap book that continued the documentation process from 1932 onward. 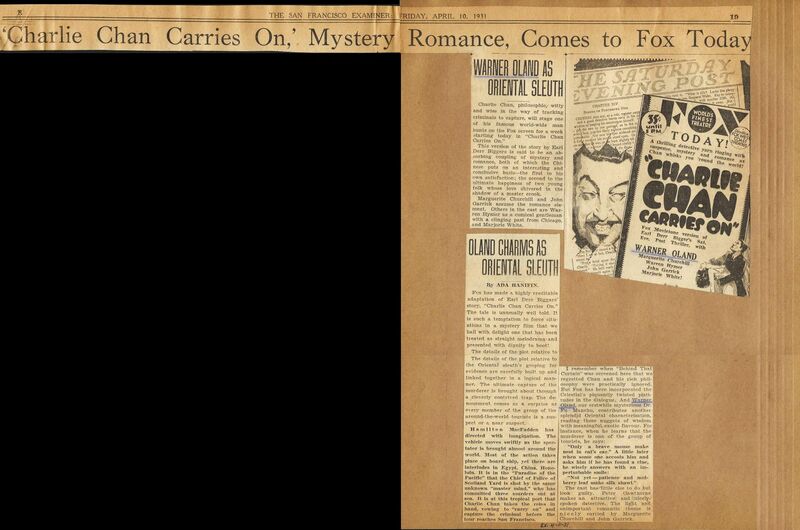 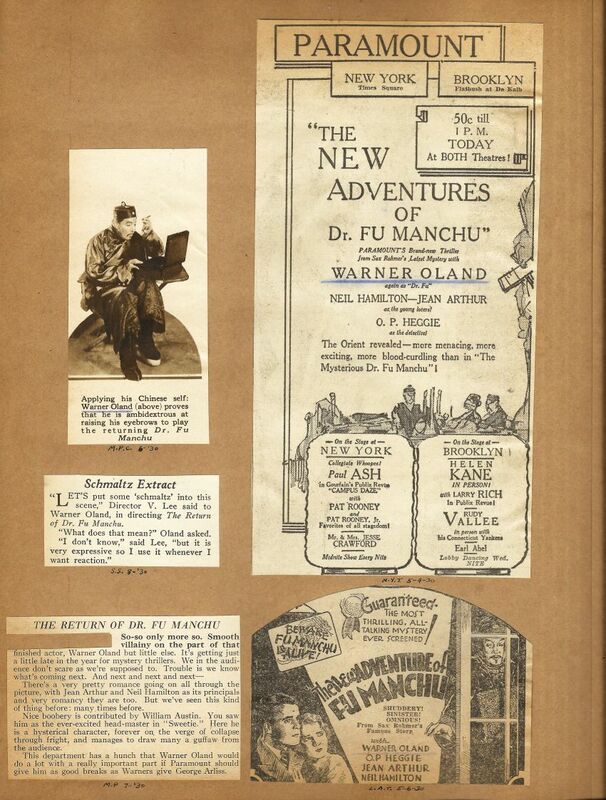 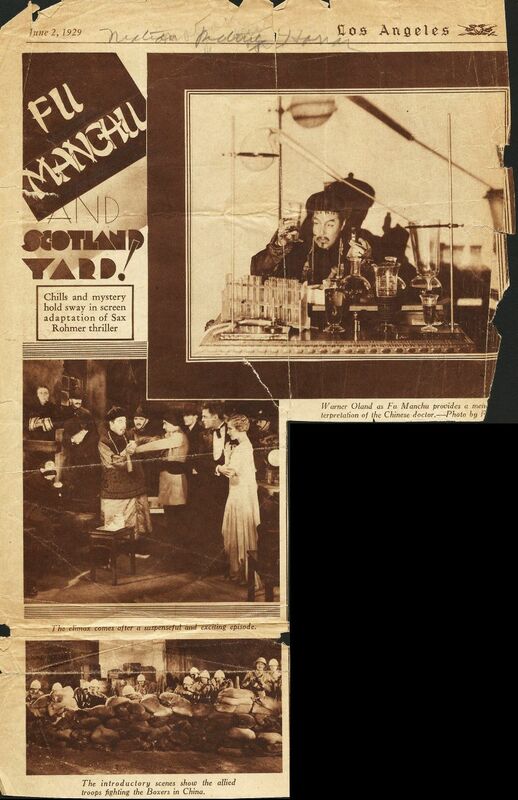 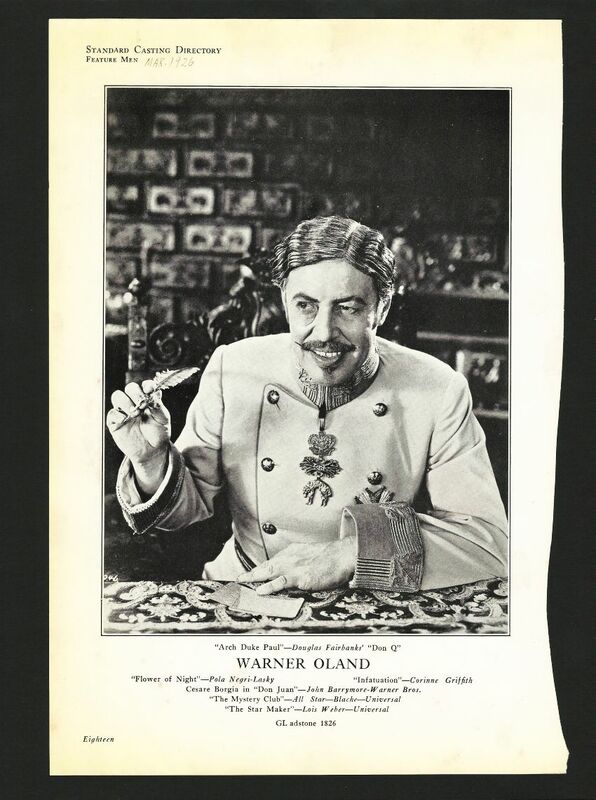 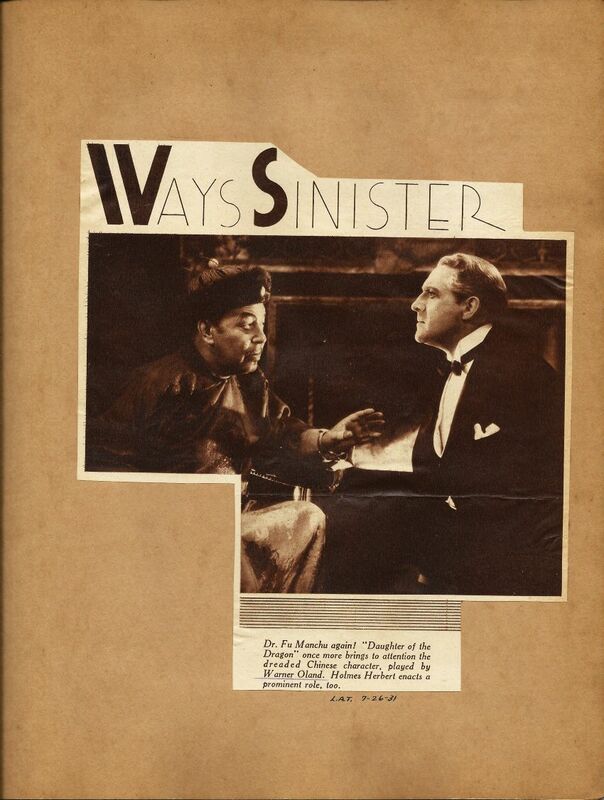 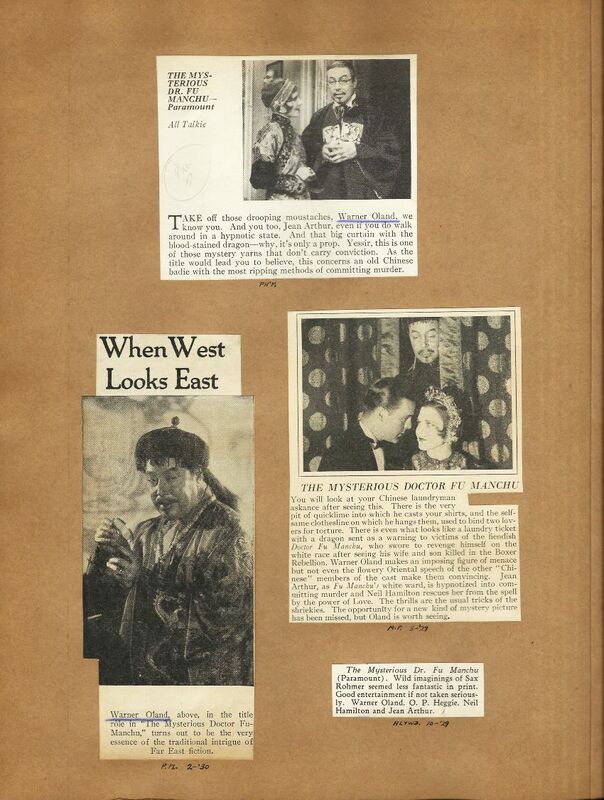 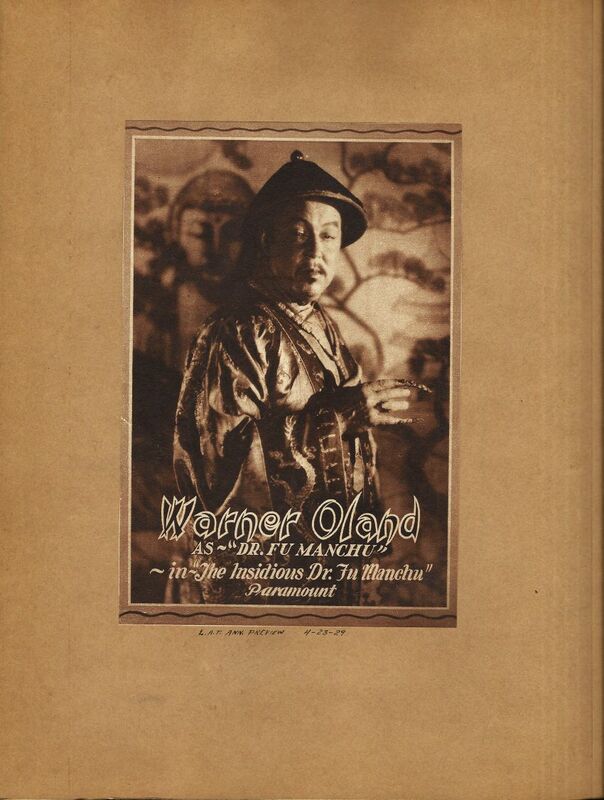 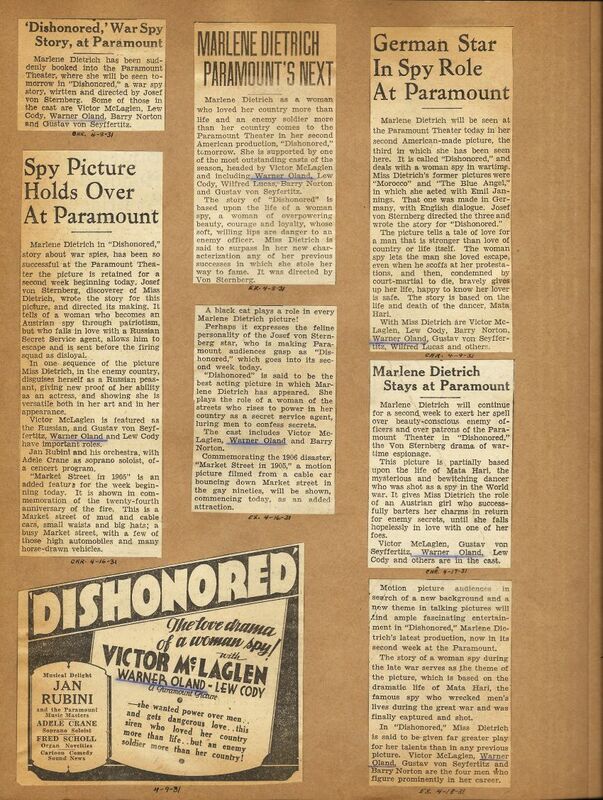 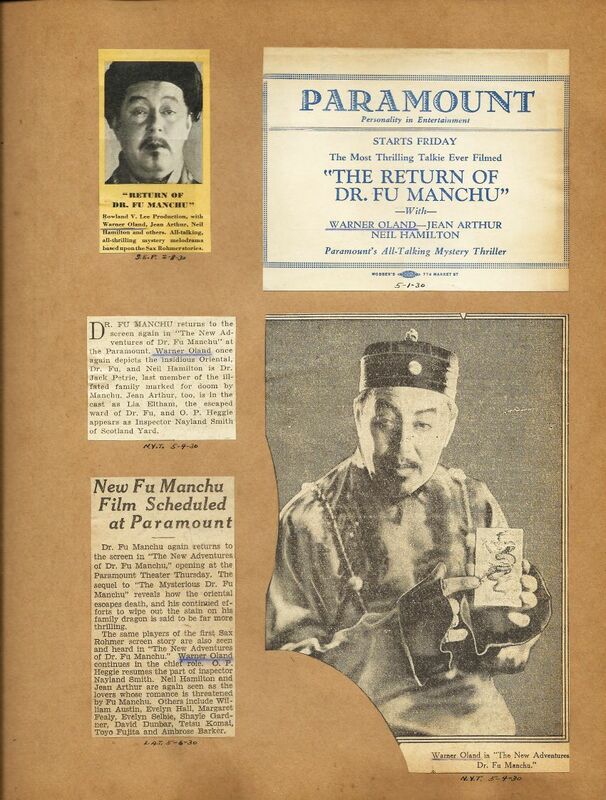 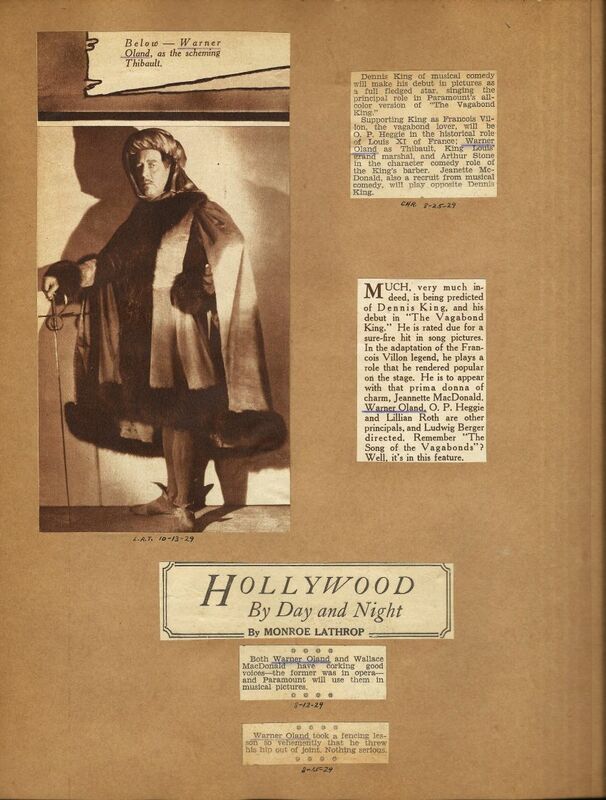 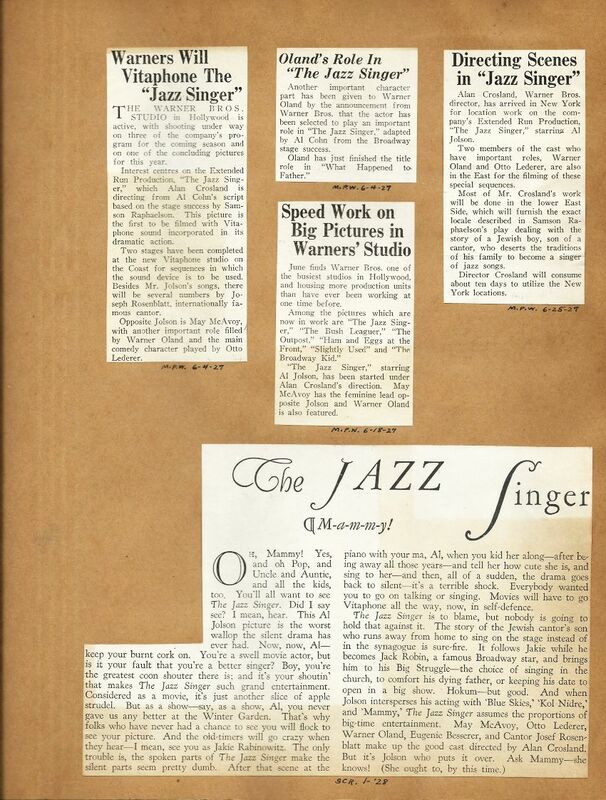 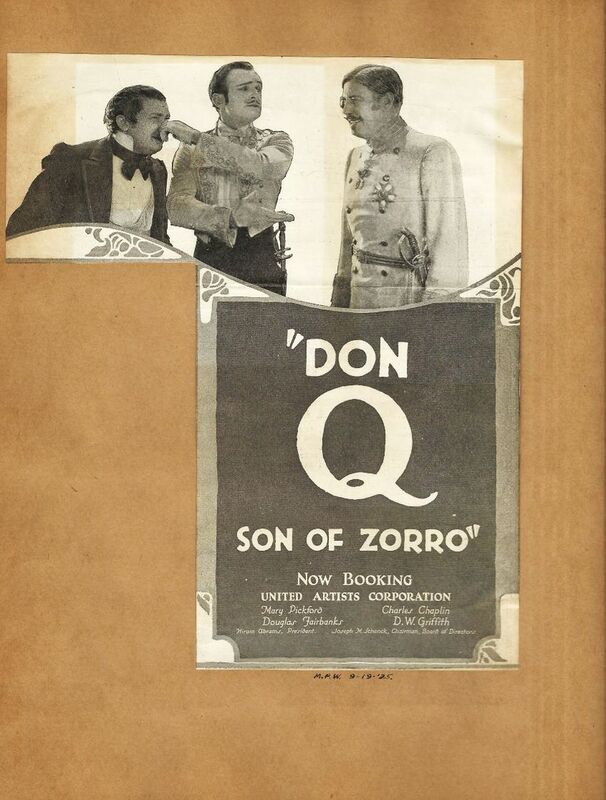 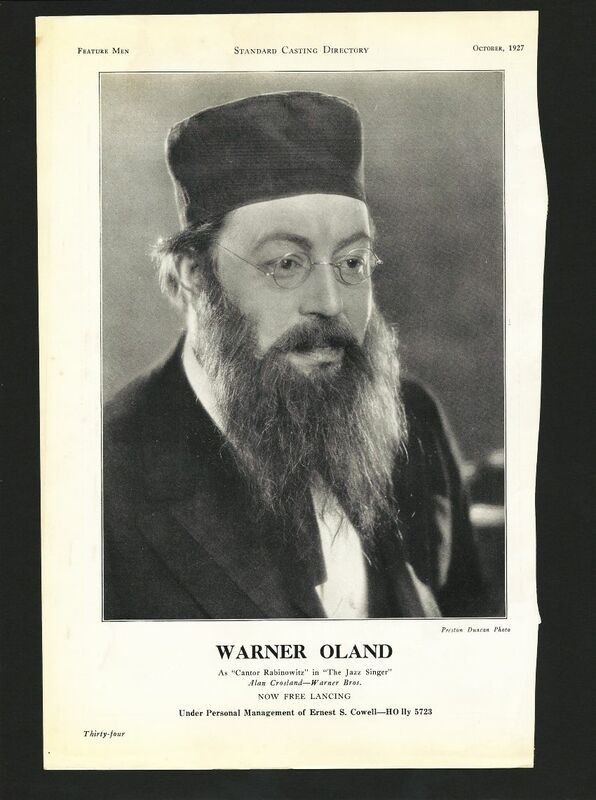 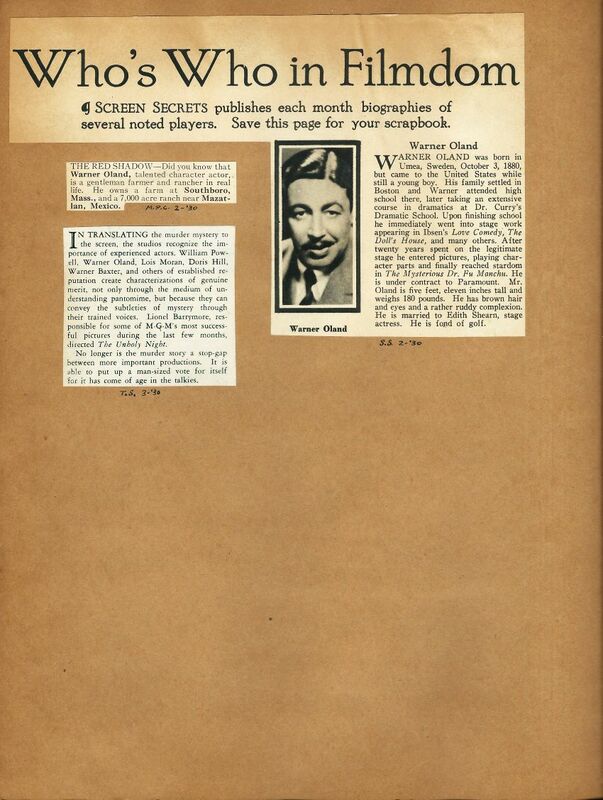 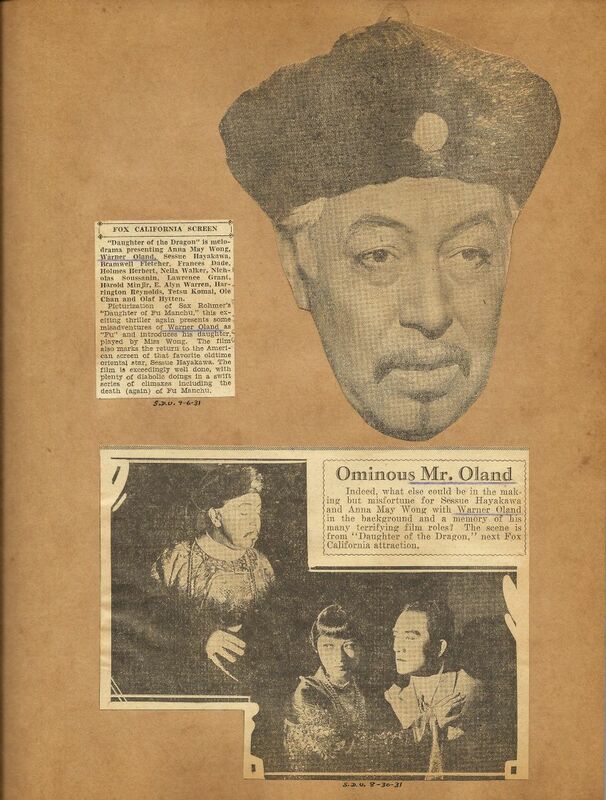 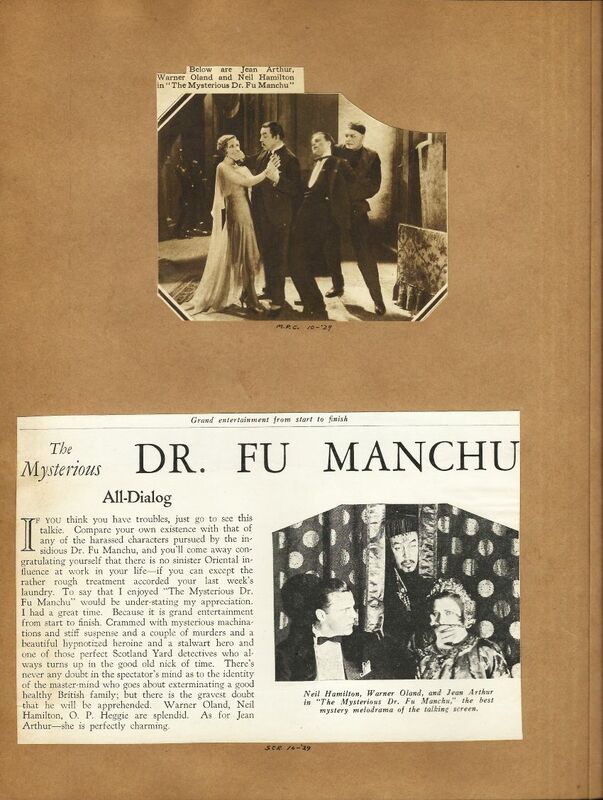 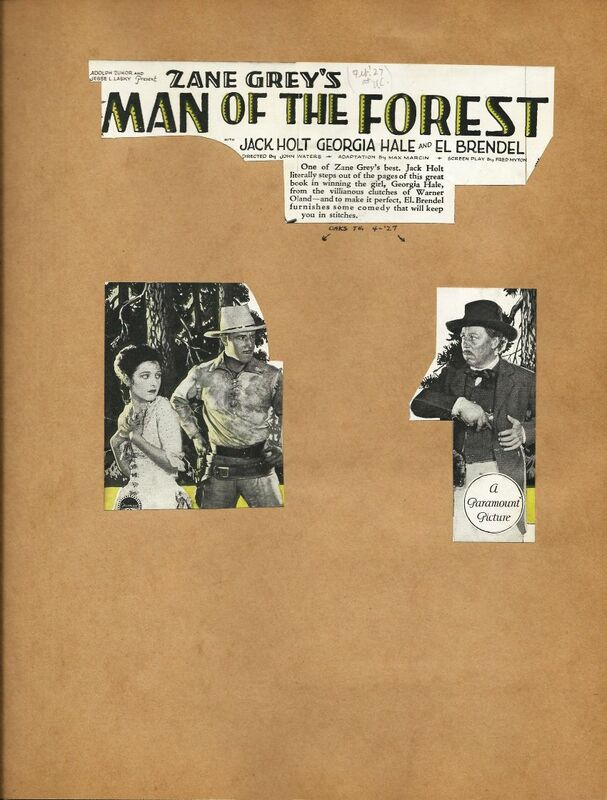 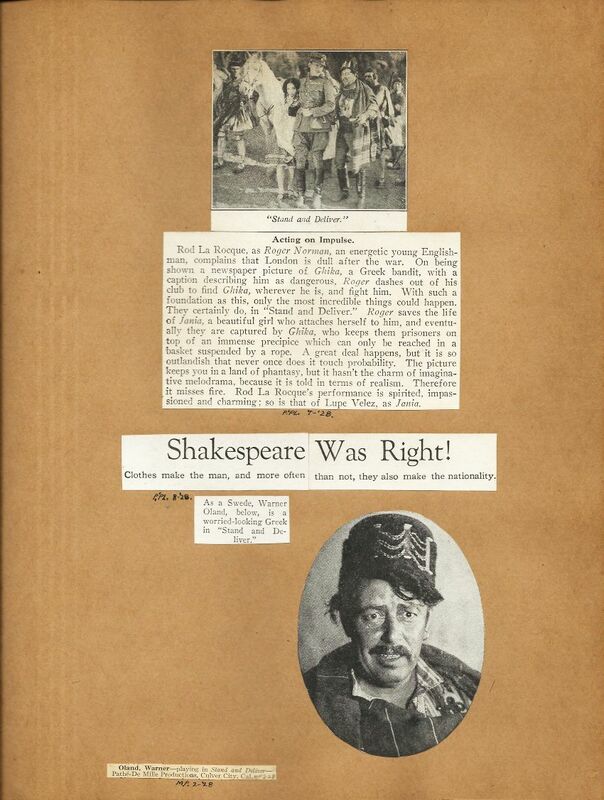 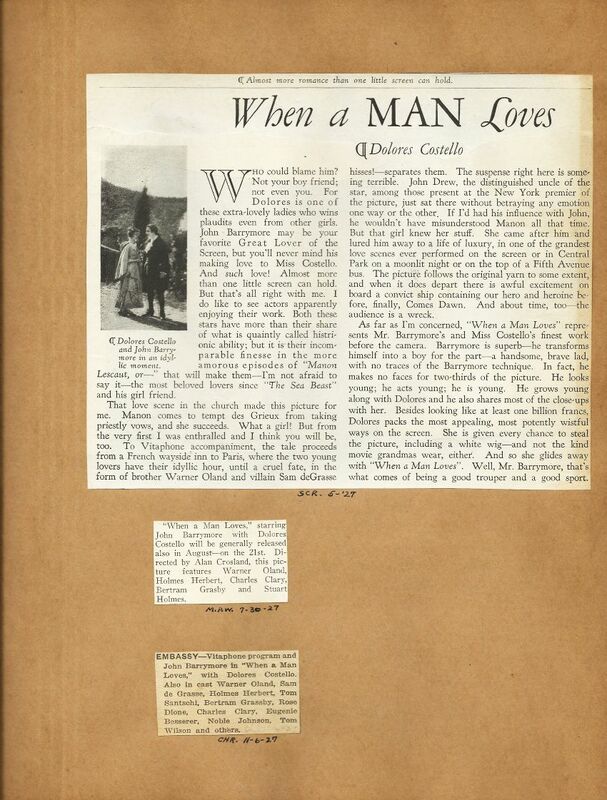 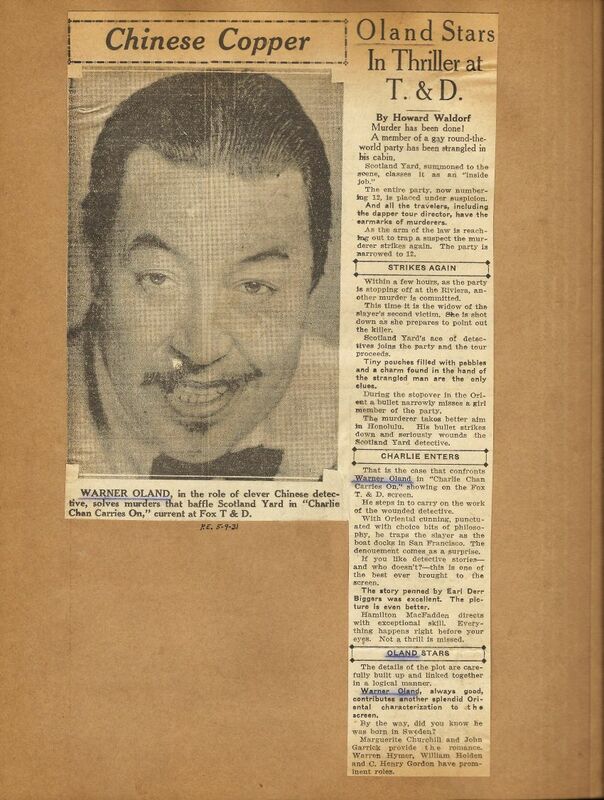 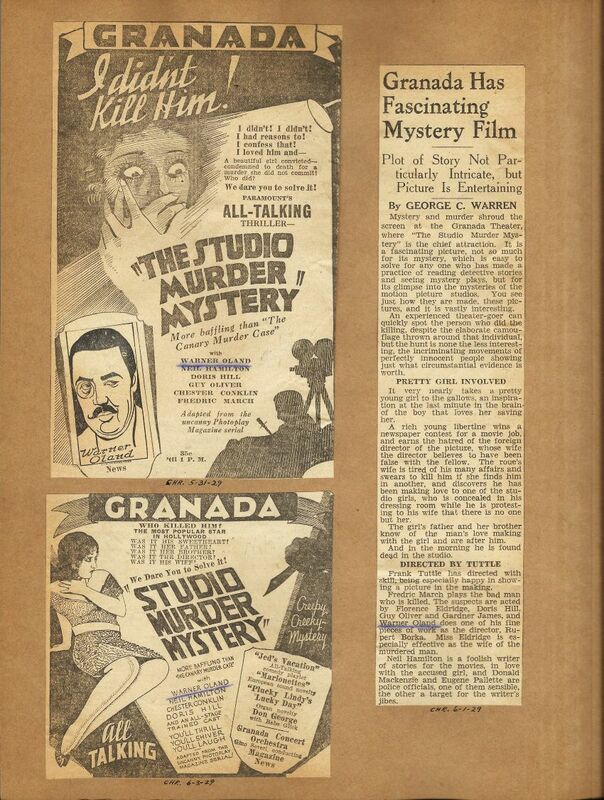 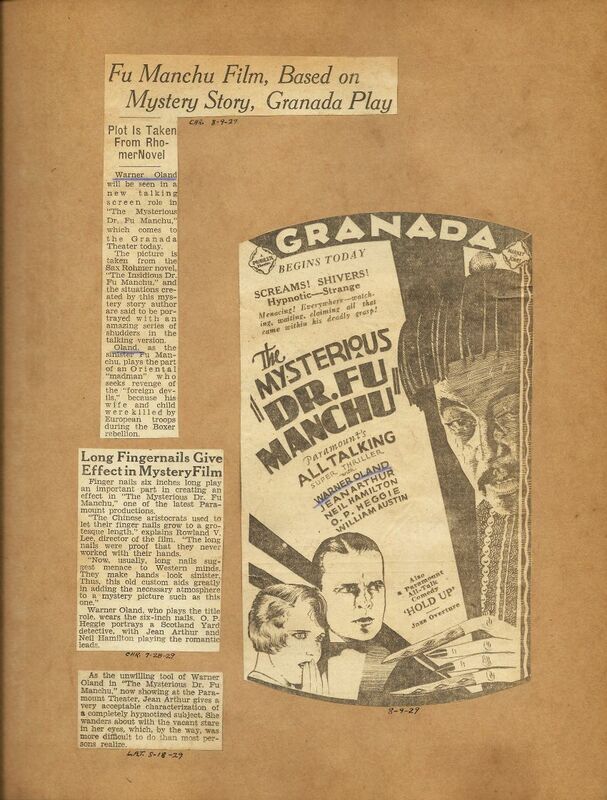 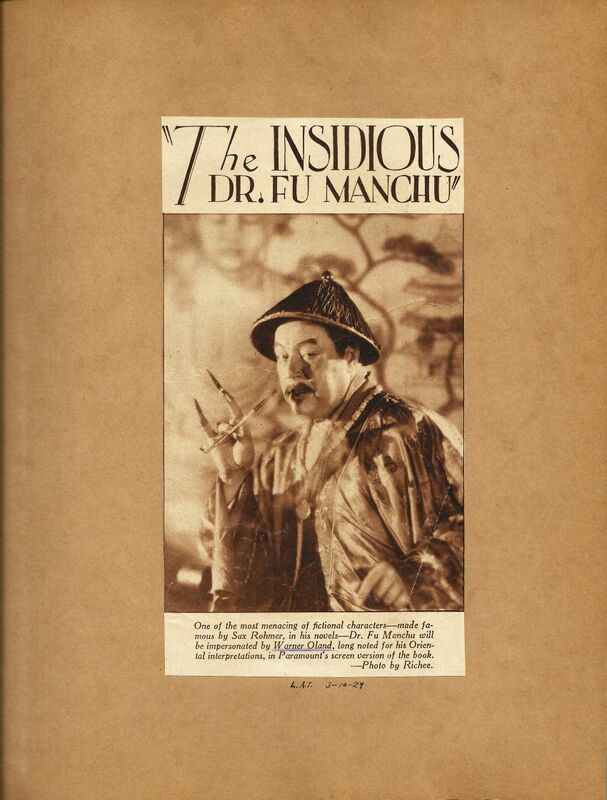 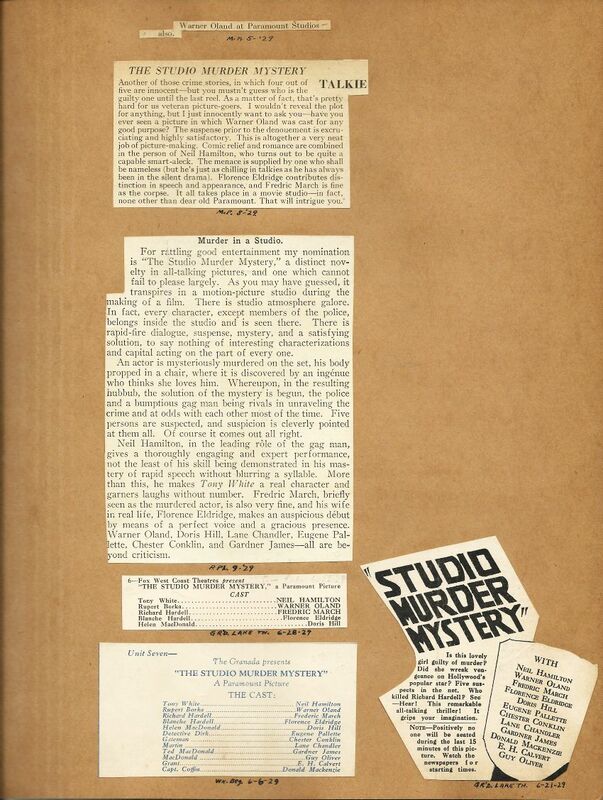 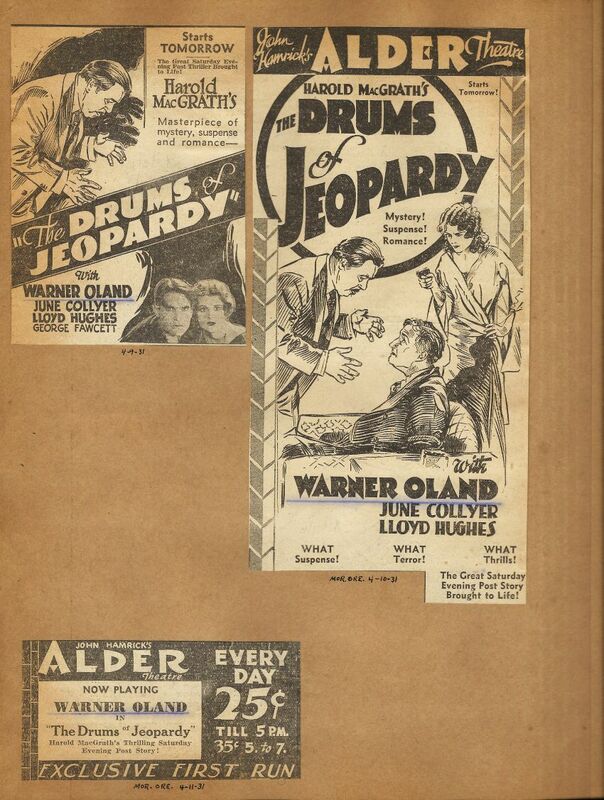 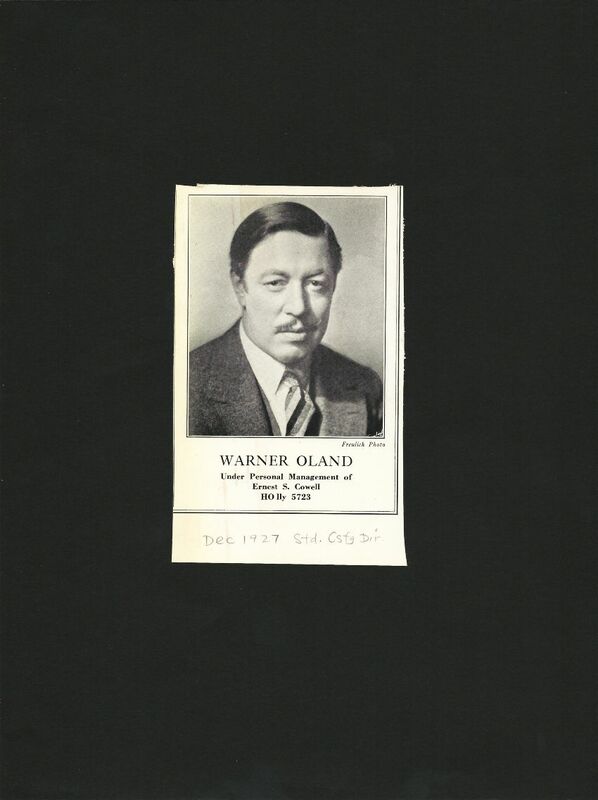 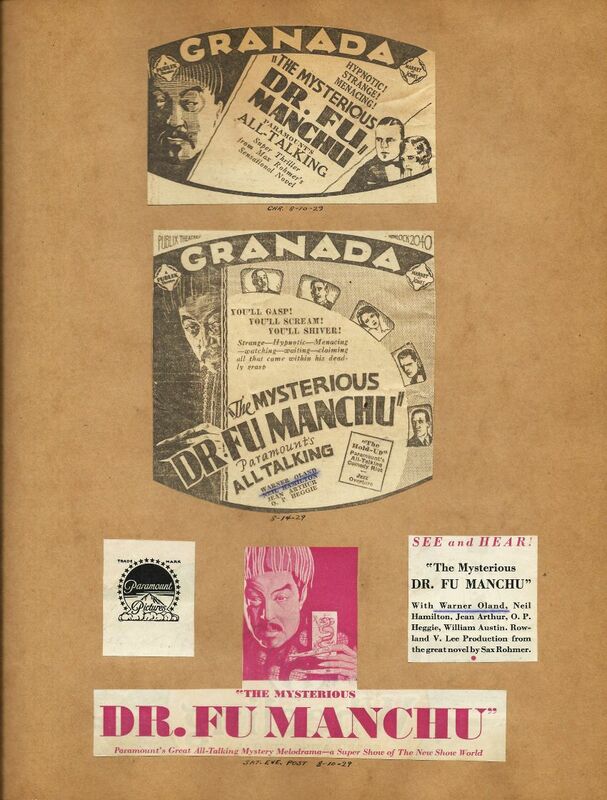 Although we can only rely on conjecture regarding who it was that actually compiled the material in this scrap book, it can be plainly seen that the person who did so was EXTREMELY devoted to Warner Oland! 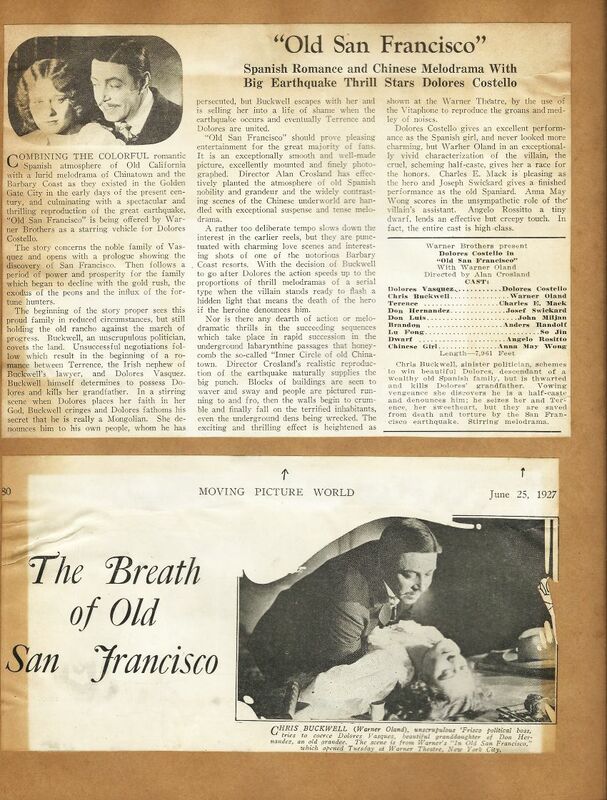 The material comes from a very broad spectrum of sources that are geographically diverse (Southern and Northern California, New York, and Boston) as well as very specialized publications common to the film trade. 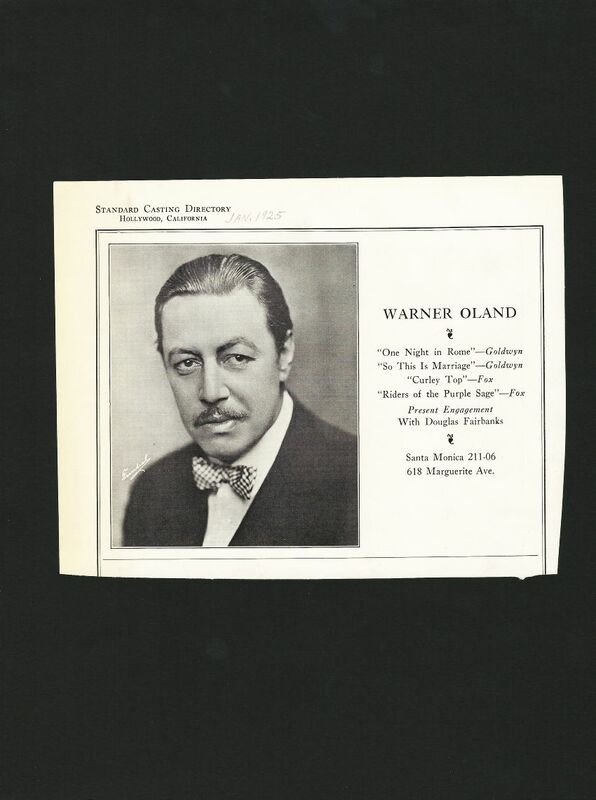 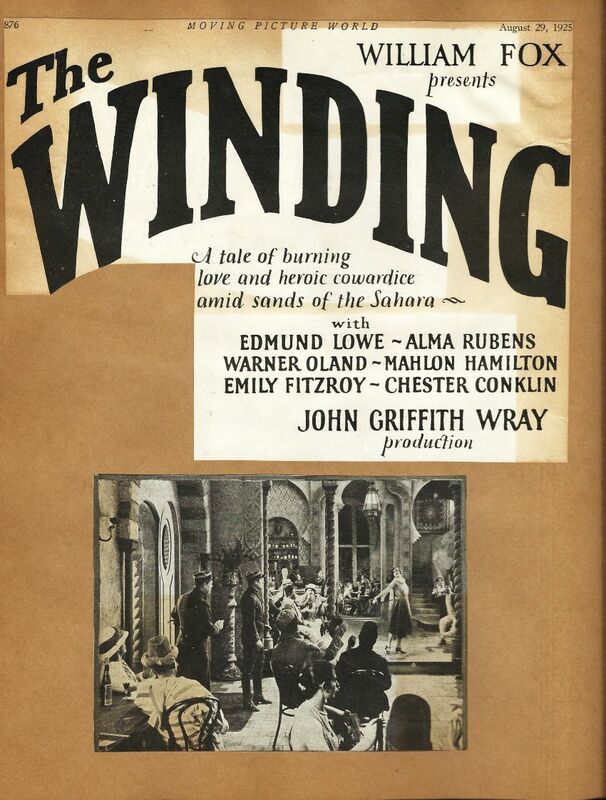 Due to the nature of the material and the sources of same collected from periodicals found in regions certainly not unfrequented by Edith and Warner Oland and the inclusion of some material that would, with few exceptions, have only been available to those in the acting profession, it is possible to cautiously suggest that it may have been none other than the actor's wife herself who was our mystery compiler. 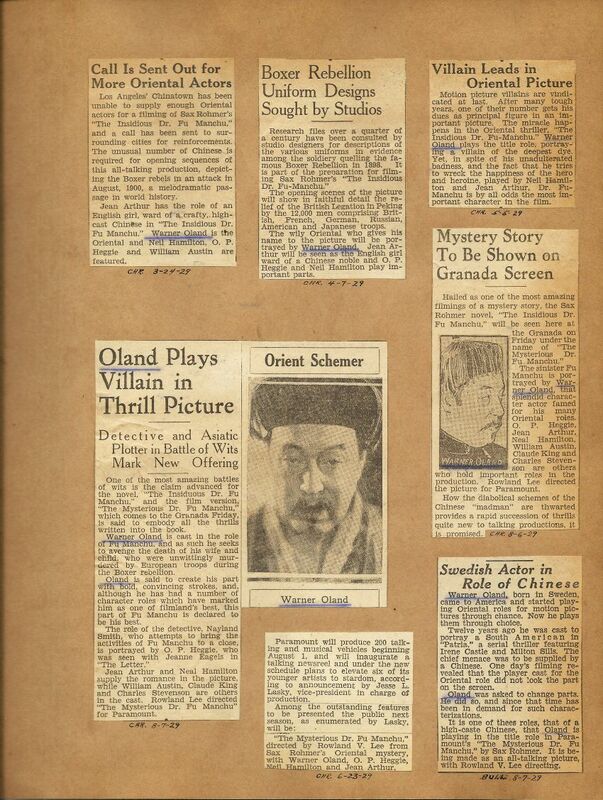 The precise and creative nature of the presentation of the material seems to point to the hand of one with artistic skills, such as was the case with Mrs. Oland. 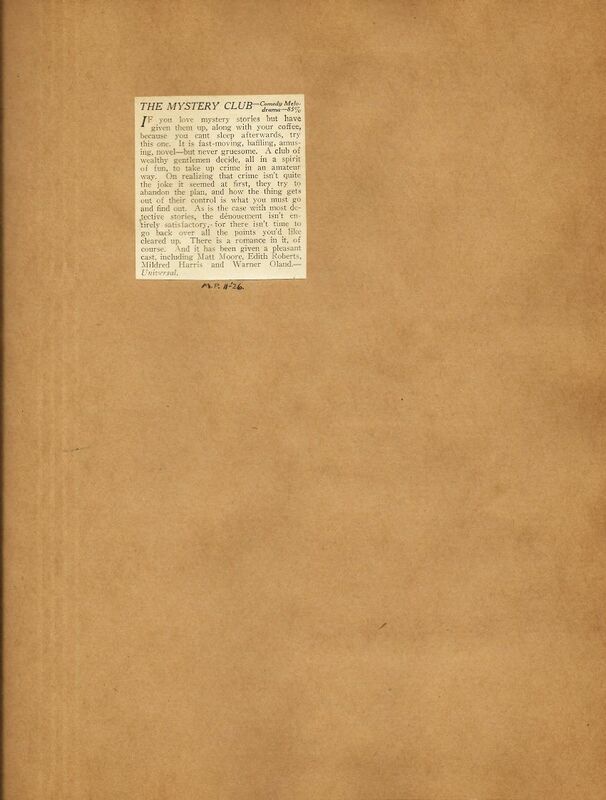 This, however, begs further study and investigation to satisfactorily resolve with any certainty. 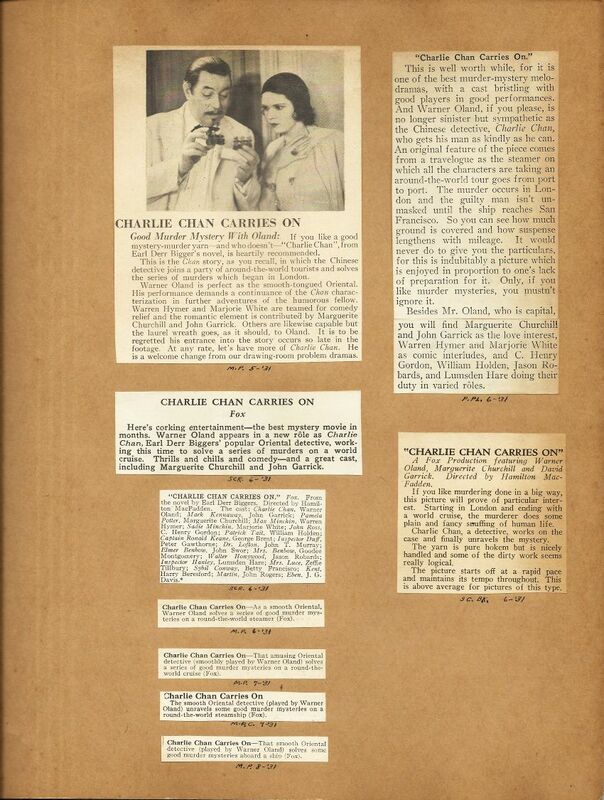 The scrap book is presented below as accurately as possible. 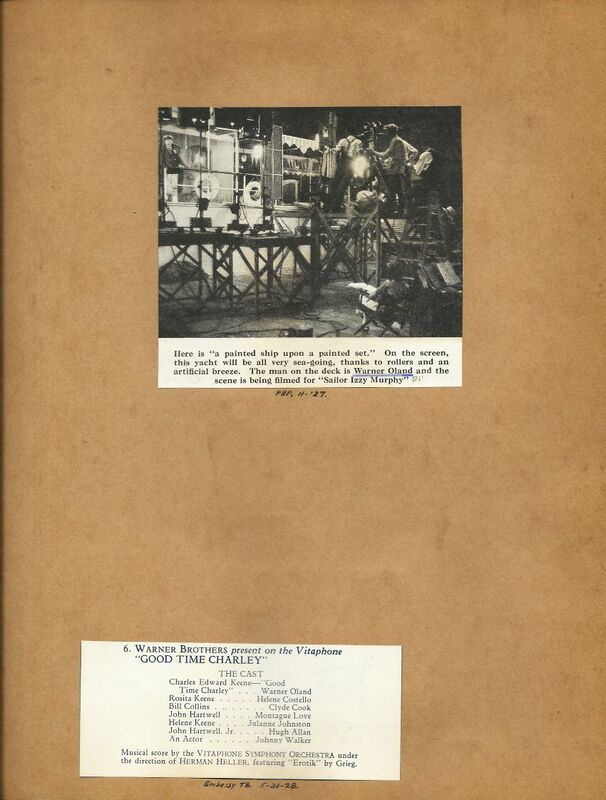 Of the 142 pages contained between its covers, 18 pages are blank, perhaps awaiting material that was never added which may have included numerous pieces of loose items which we have presented in the locations which they were found throughout the scrap book. 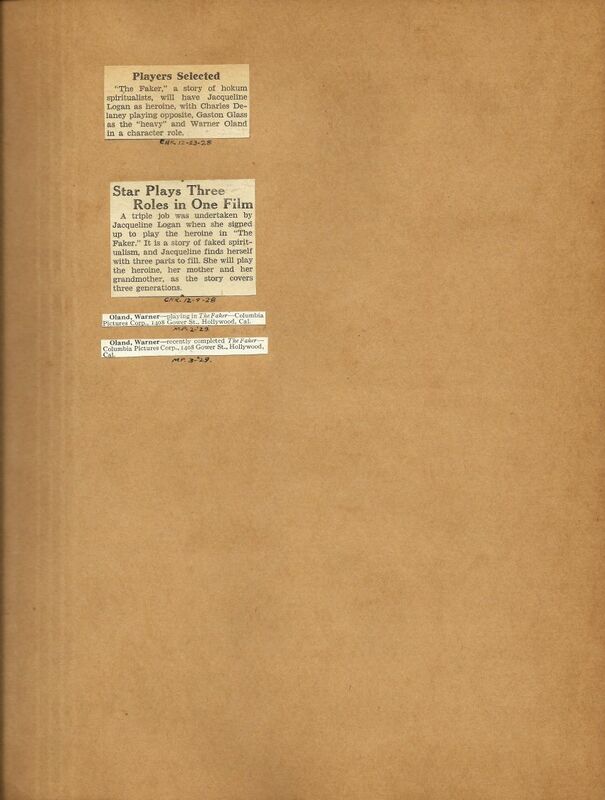 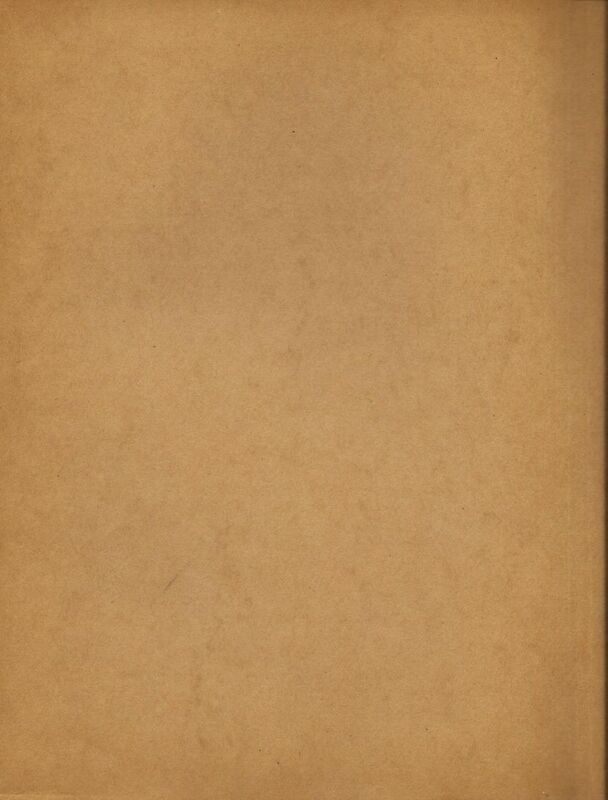 Also, the third page contains material from the years 1929 and 1932 which was probably added, out of sequence, to what had been a blank page. 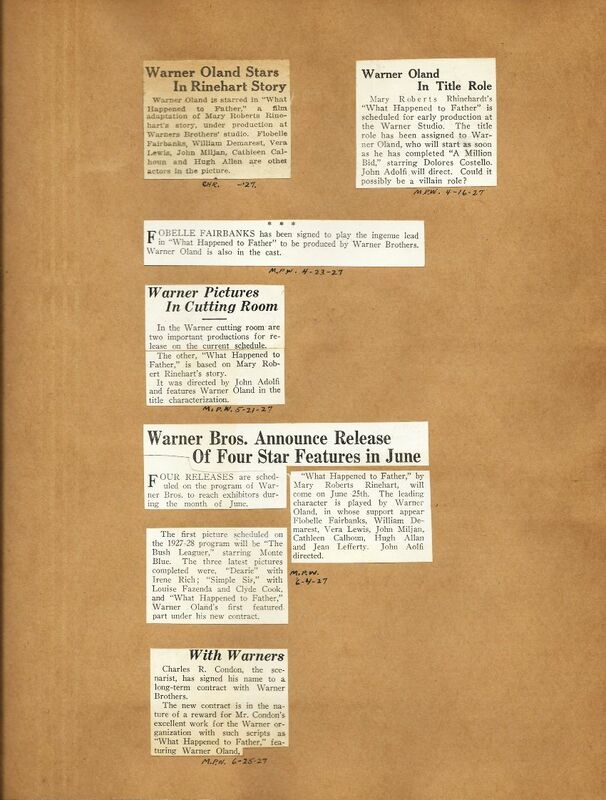 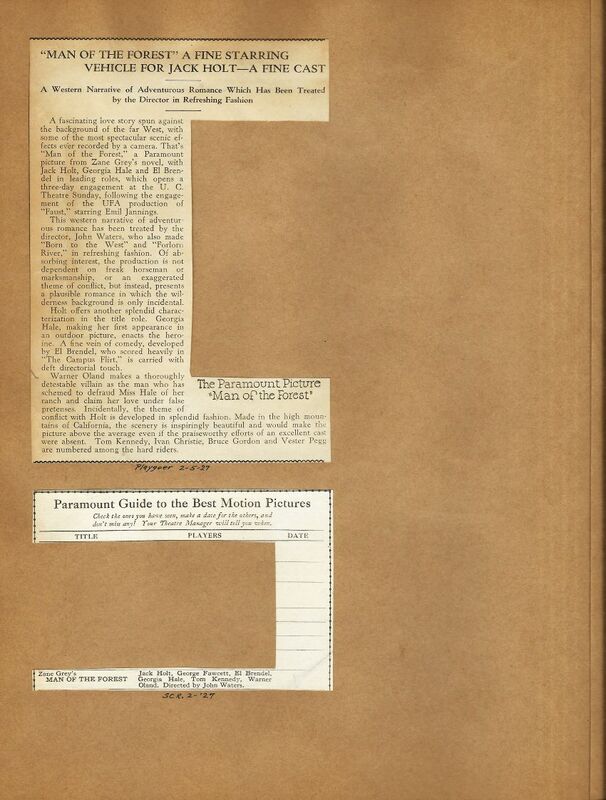 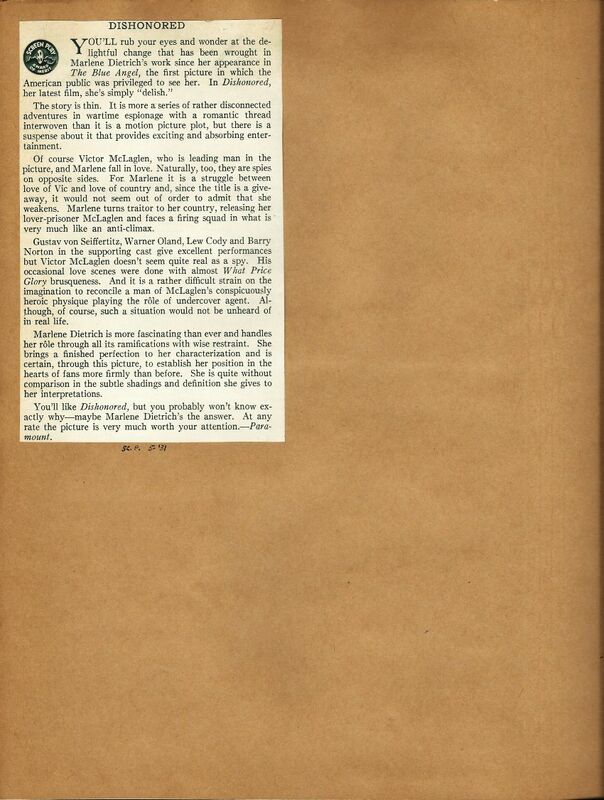 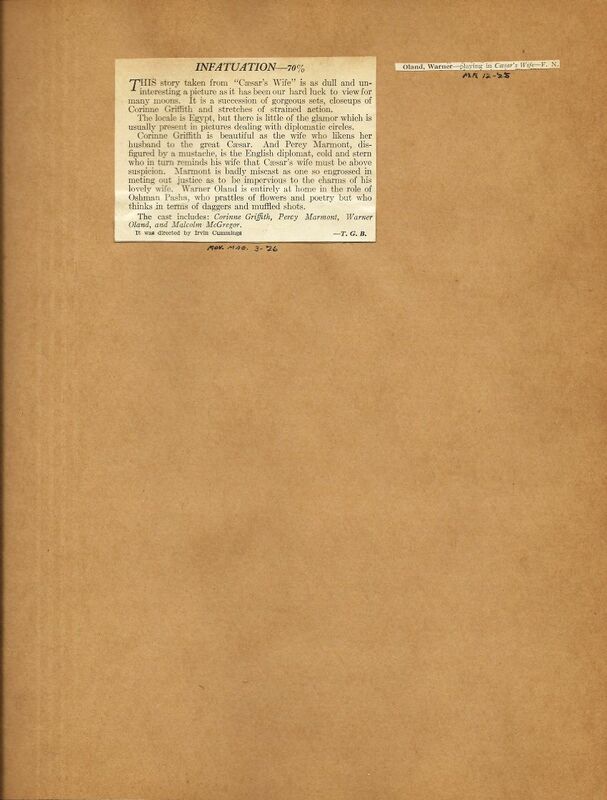 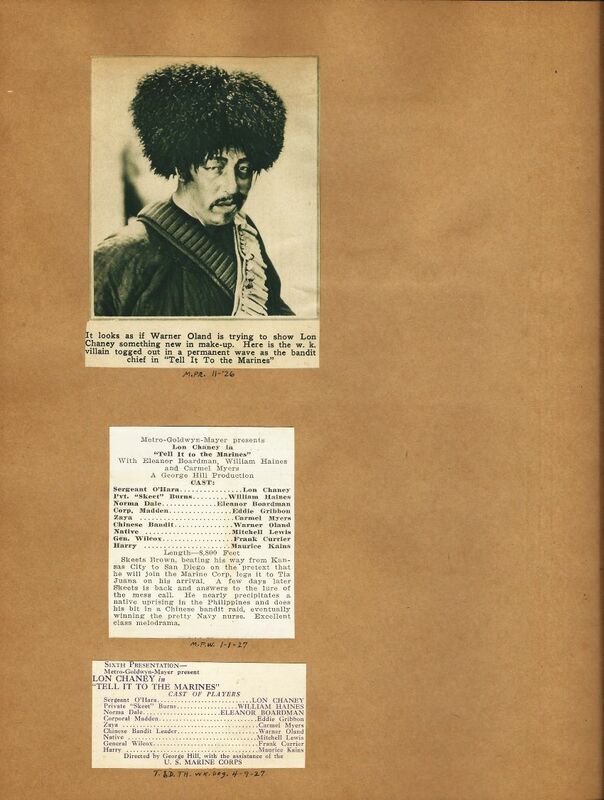 Finally, some of the pasted material includes examples that were too large to be contained on a page. 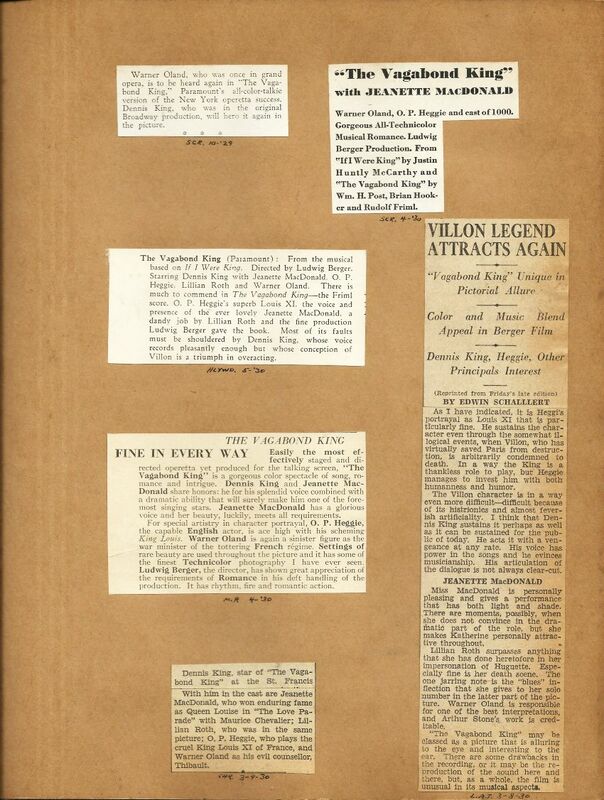 These articles were pasted in such a way that they require unfolding in order to fully see. 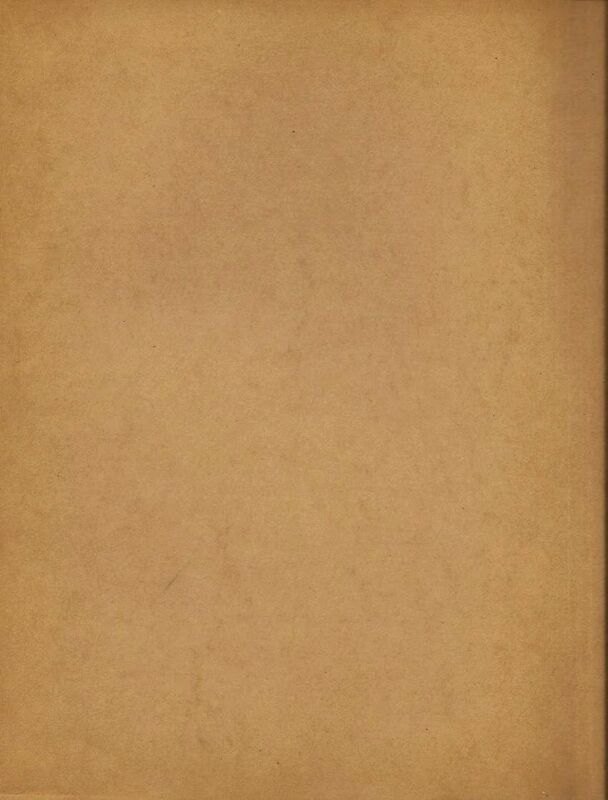 In these cases, the material is presented as unfolded. 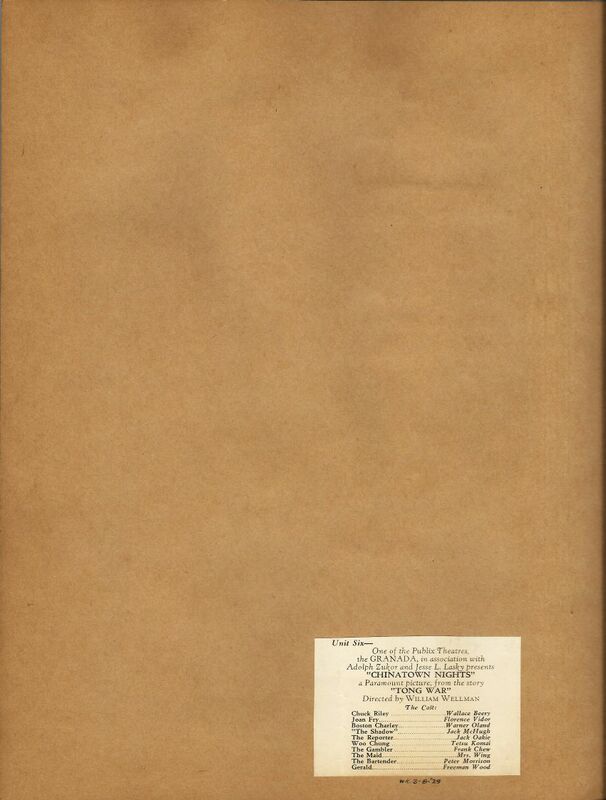 As noted above, the material included in the scrap book was meticulously documented as to date and source through the use of a system of codes. 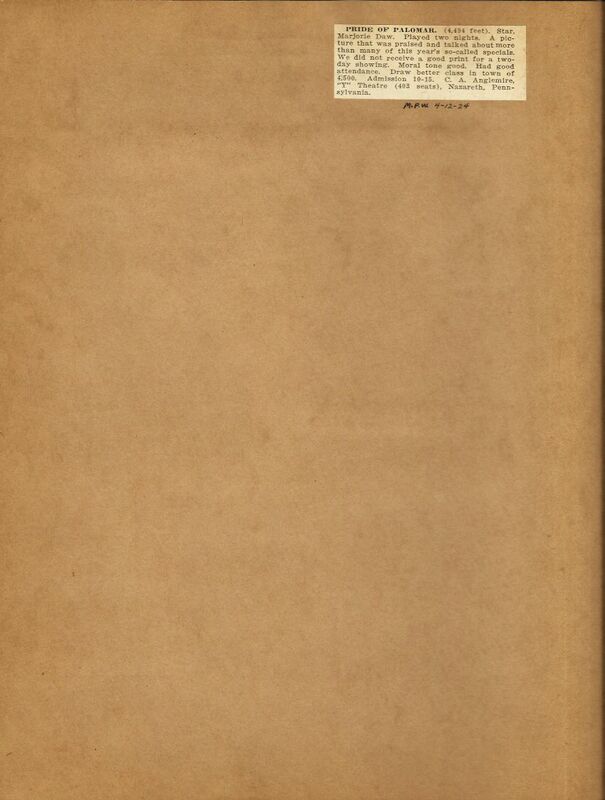 For example, "L.A.T." 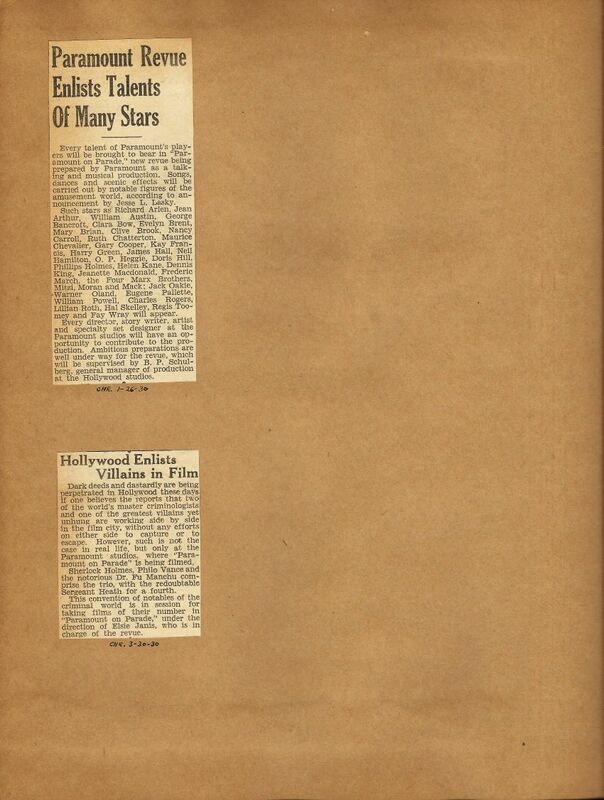 refers to the Los Angeles Times, "M.P.W." 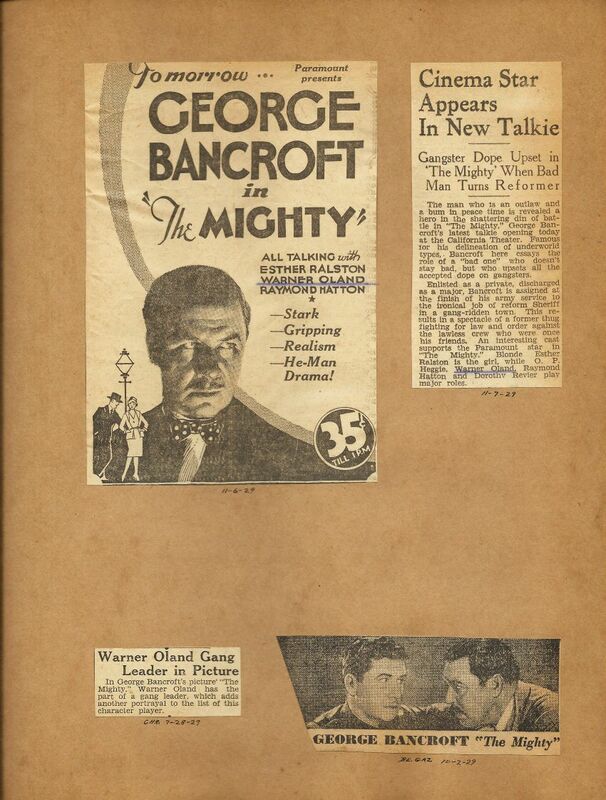 stands for Motion Picture Weekly, "N.Y.T." 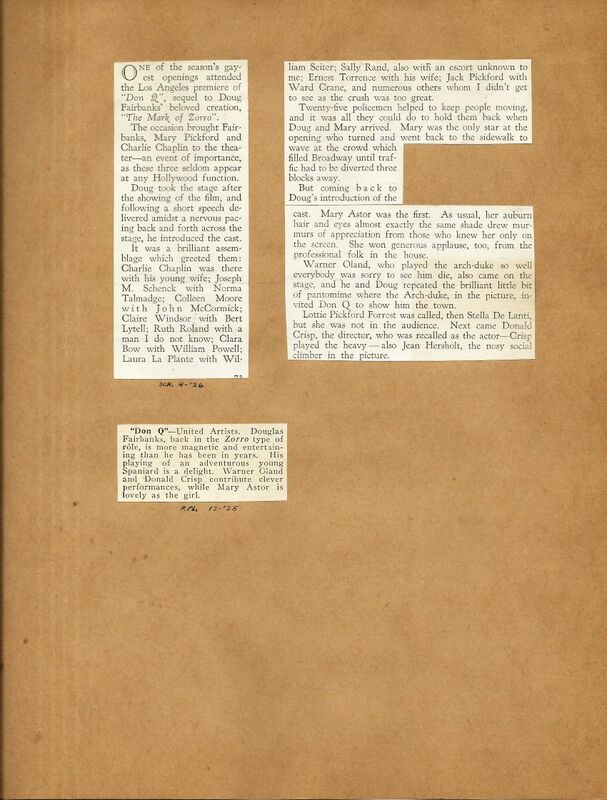 is an abbreviation for New York Times, and so on. 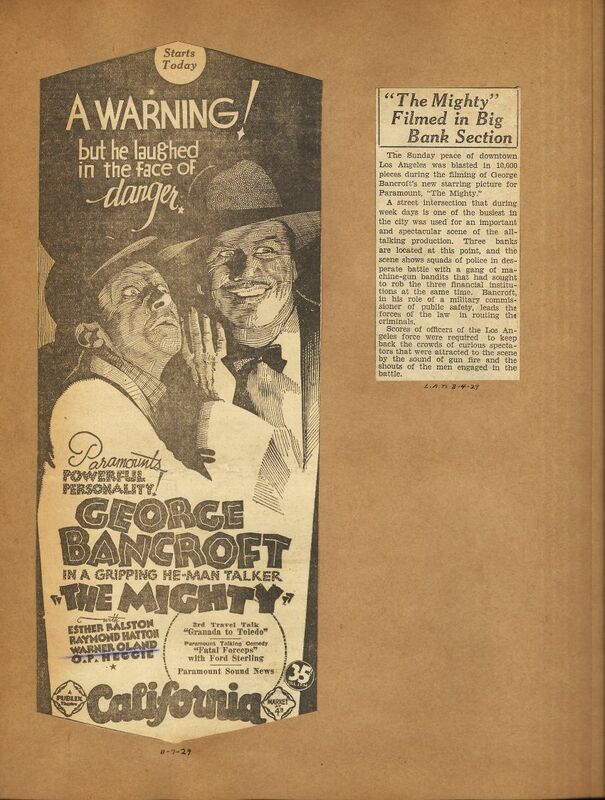 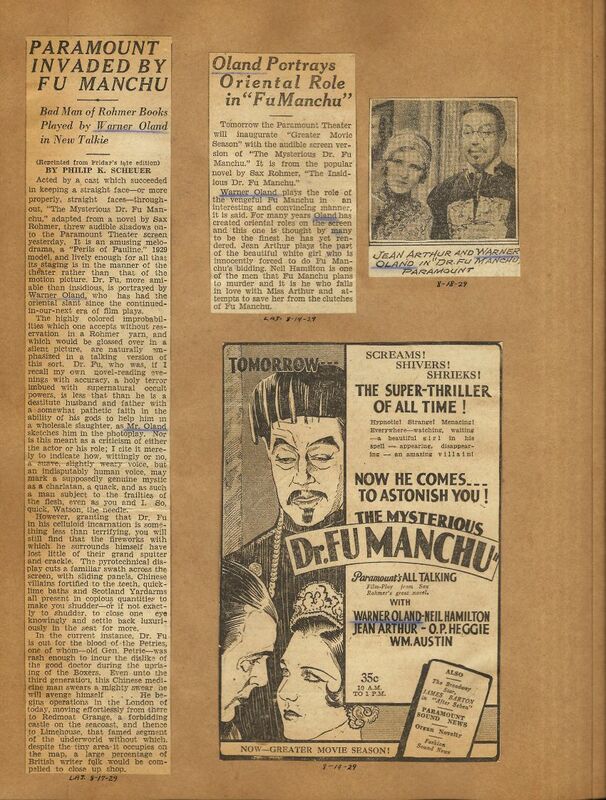 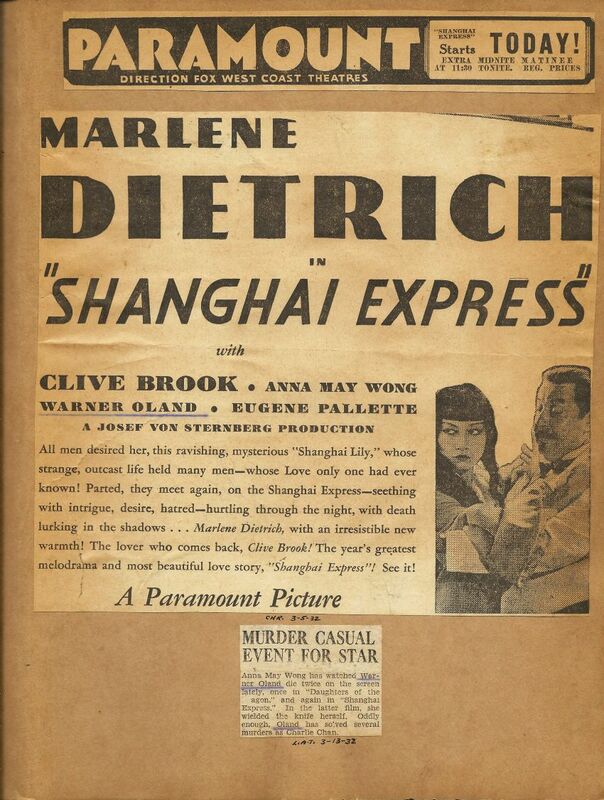 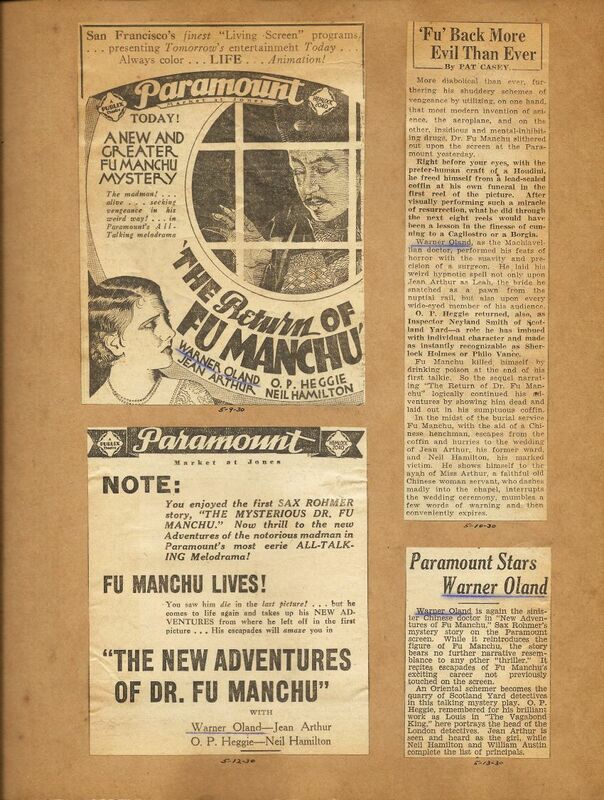 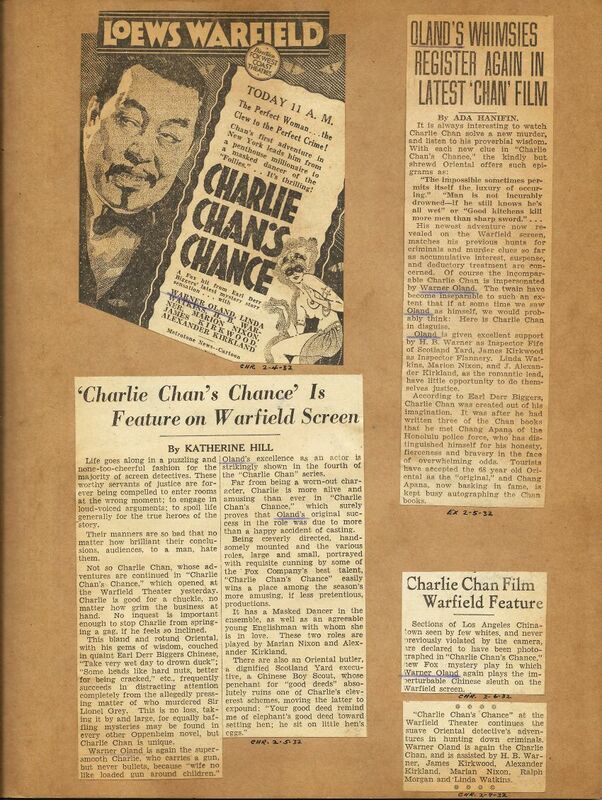 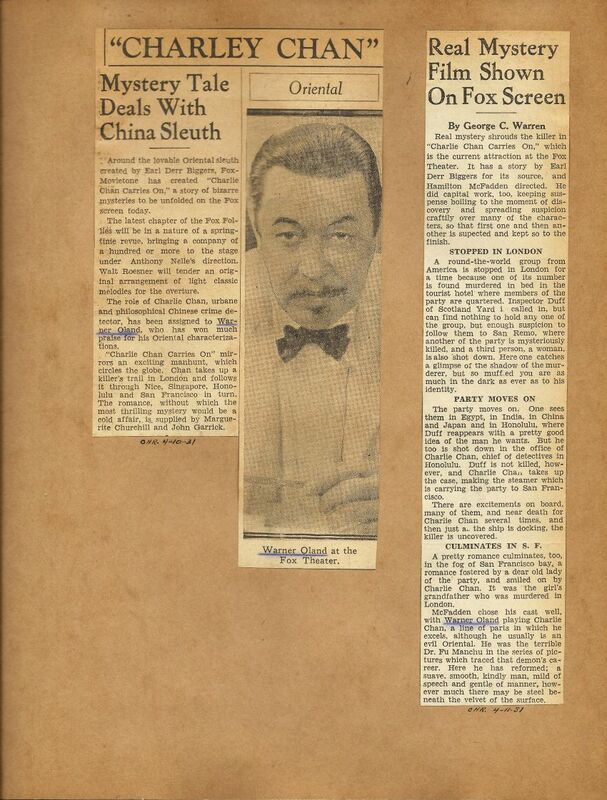 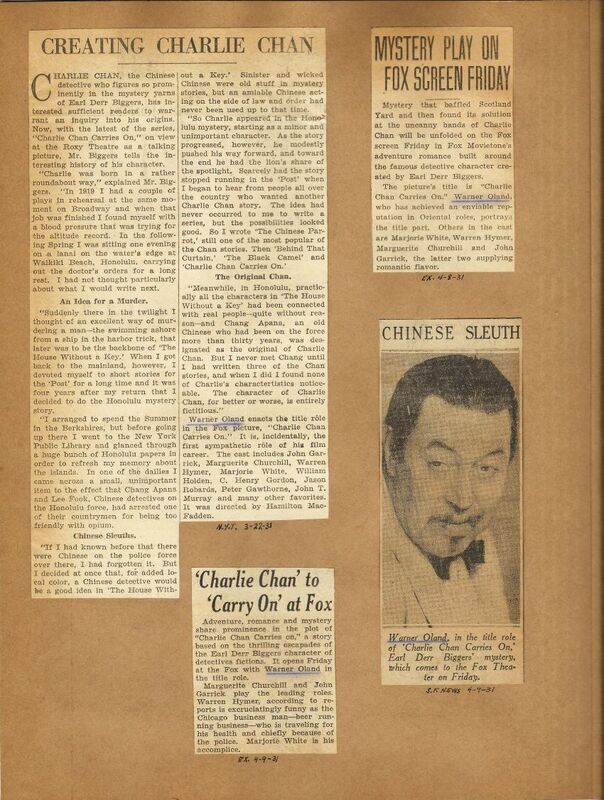 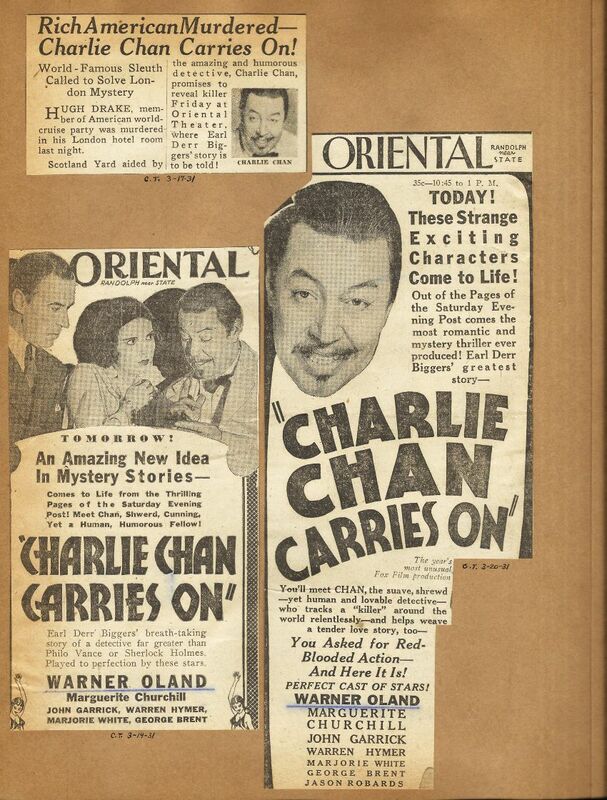 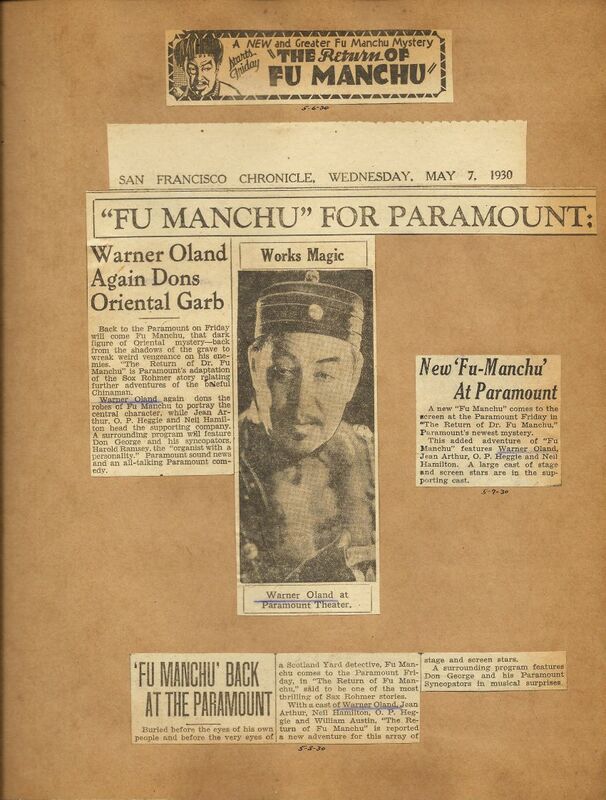 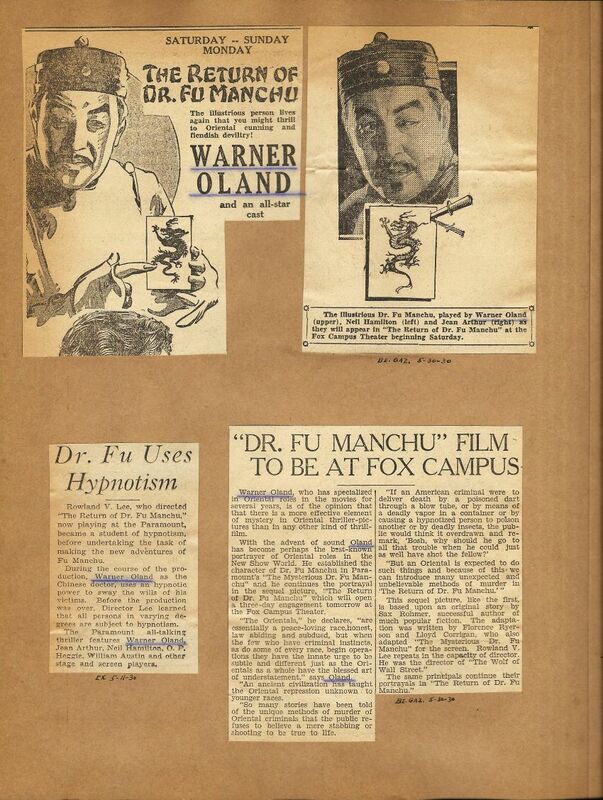 So, now, it is hoped that you will have many moments of enjoyment and discovery as you stroll through more than a decade-and-a-half of the film career of the man who eventually brought honorable Detective Charlie Chan to life on the big screen, Warner Oland. 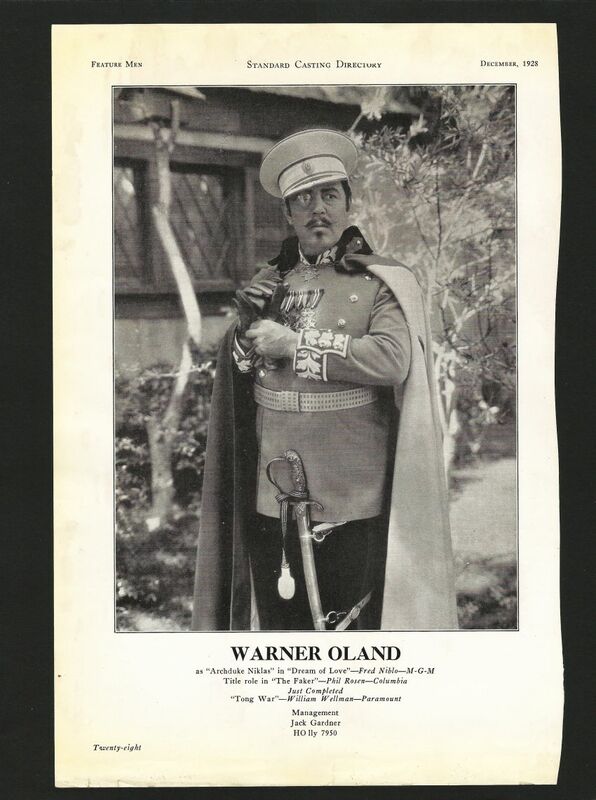 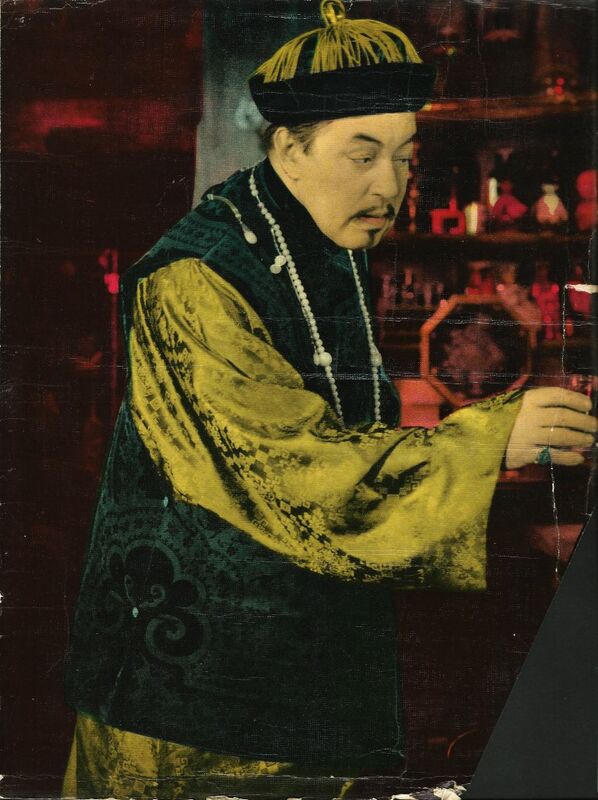 We are also privileged to note the many notable actors and actresses with whom Mr. Oland worked, including Theda Bara, Douglas Fairbanks, Lon Chaney, John Barrymore, Mary Astor, Al Jolson, Wallace Berry, Anna May Wong, and so many more. 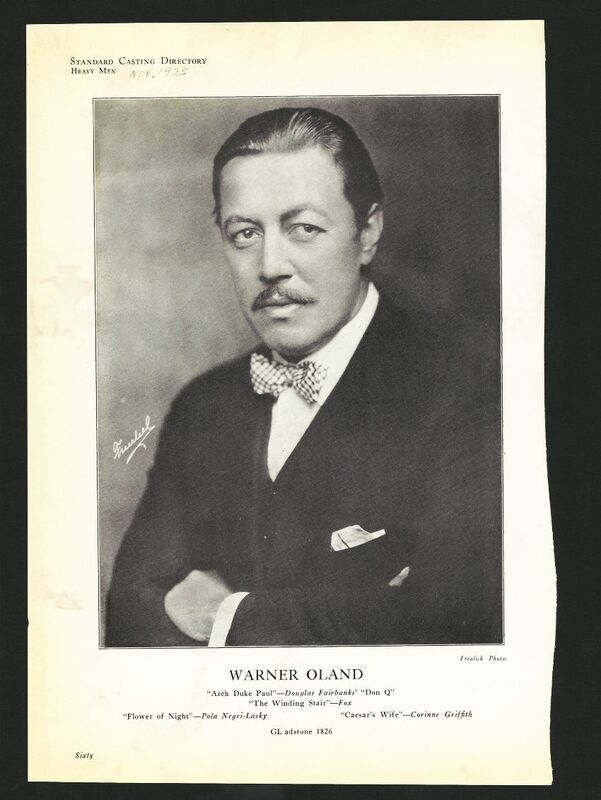 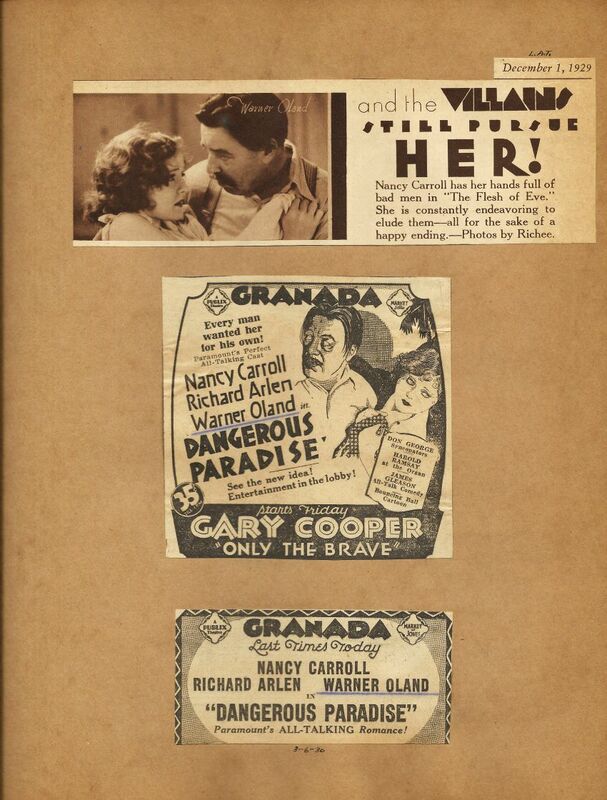 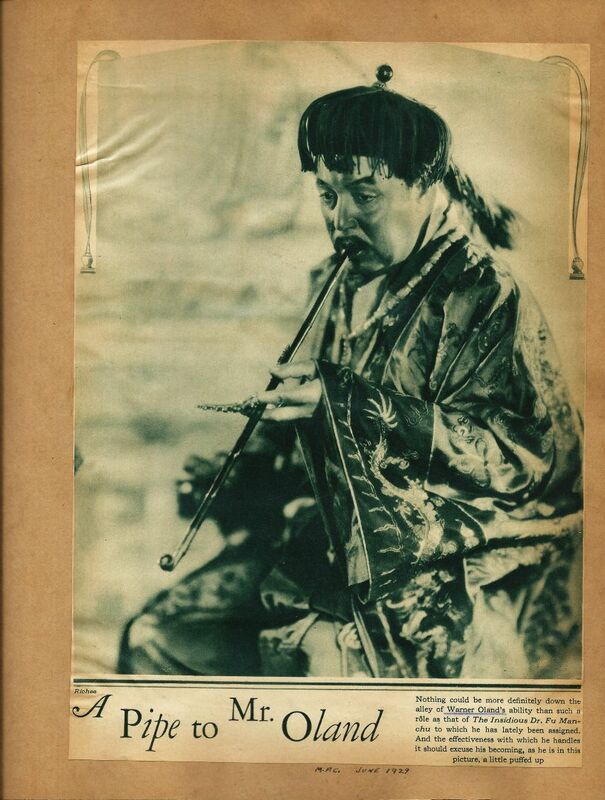 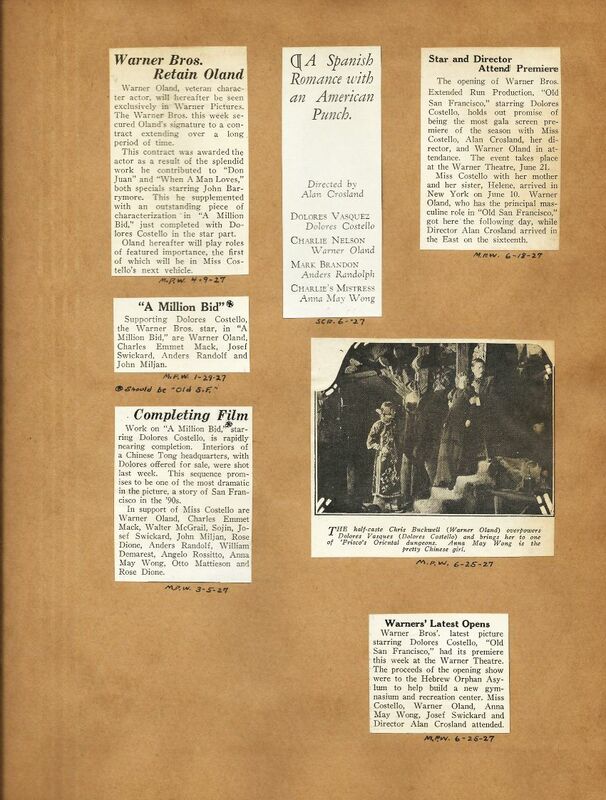 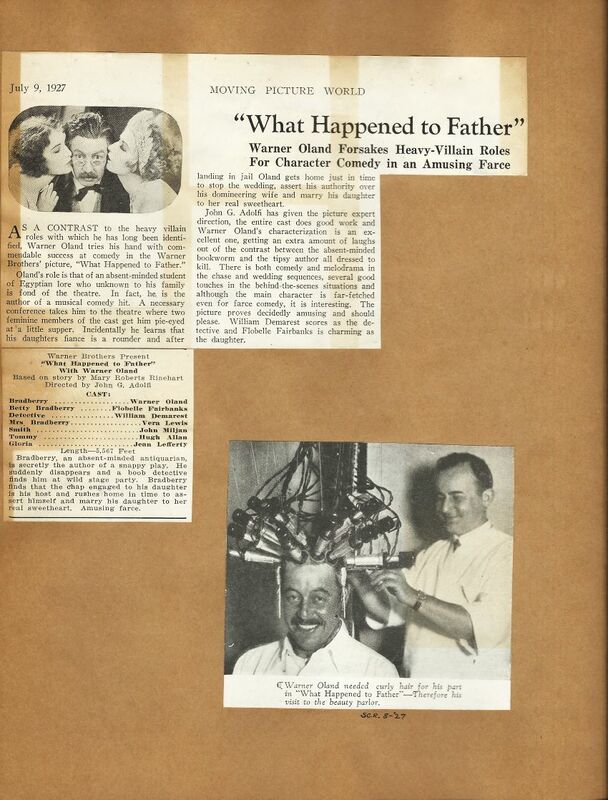 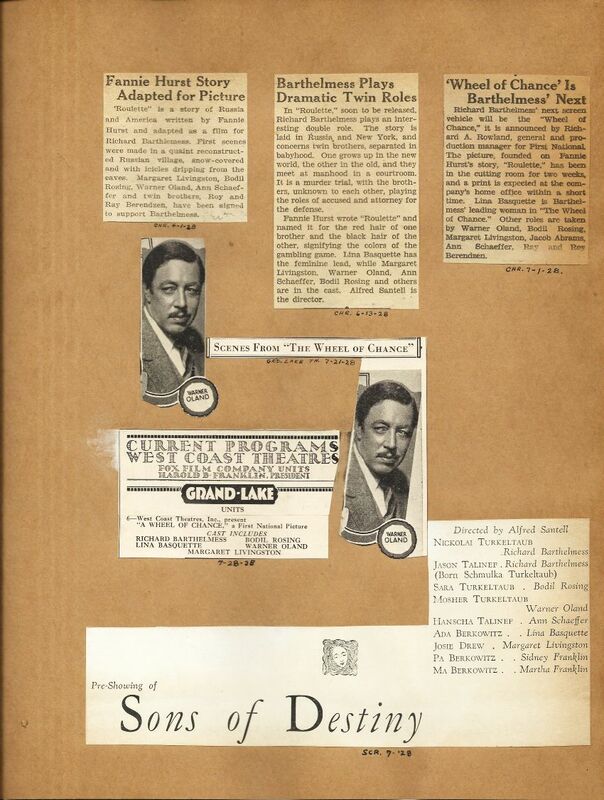 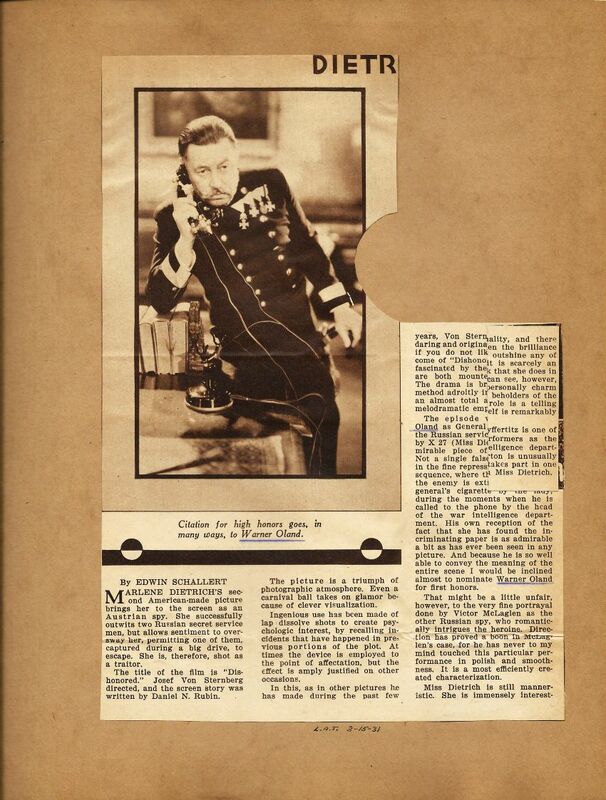 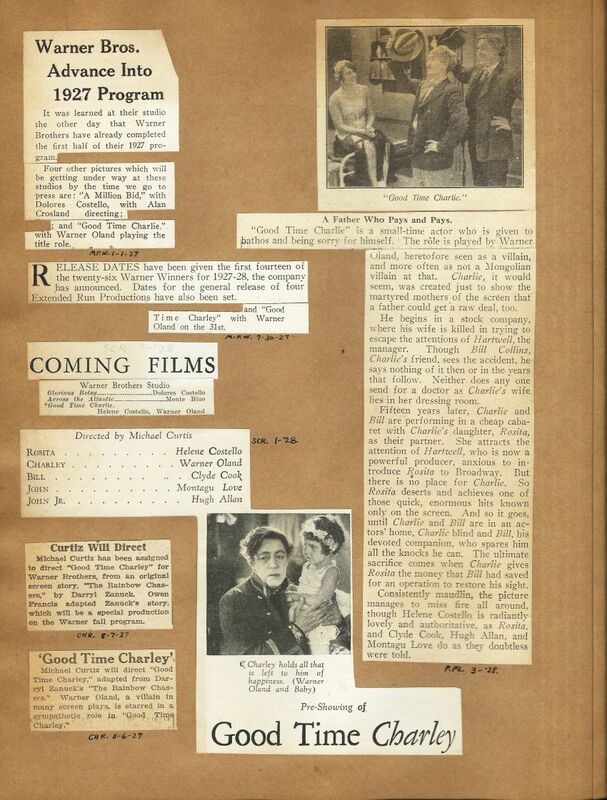 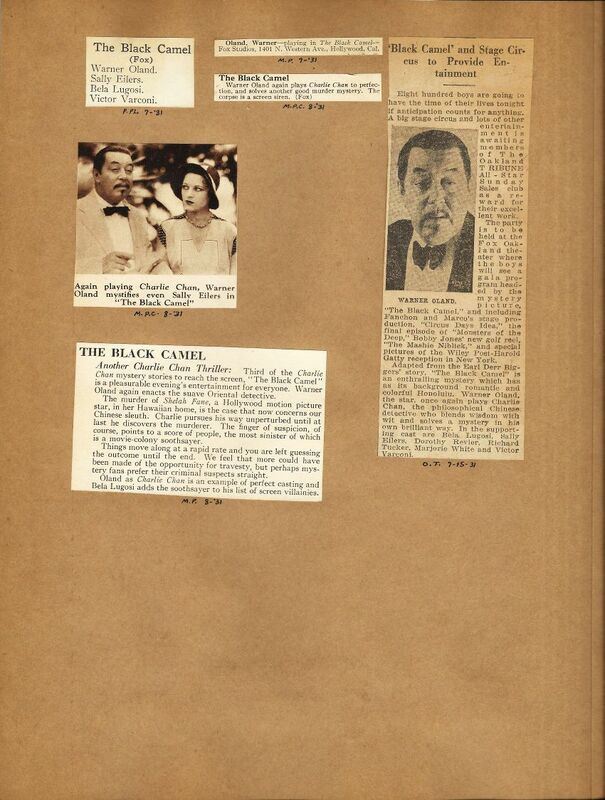 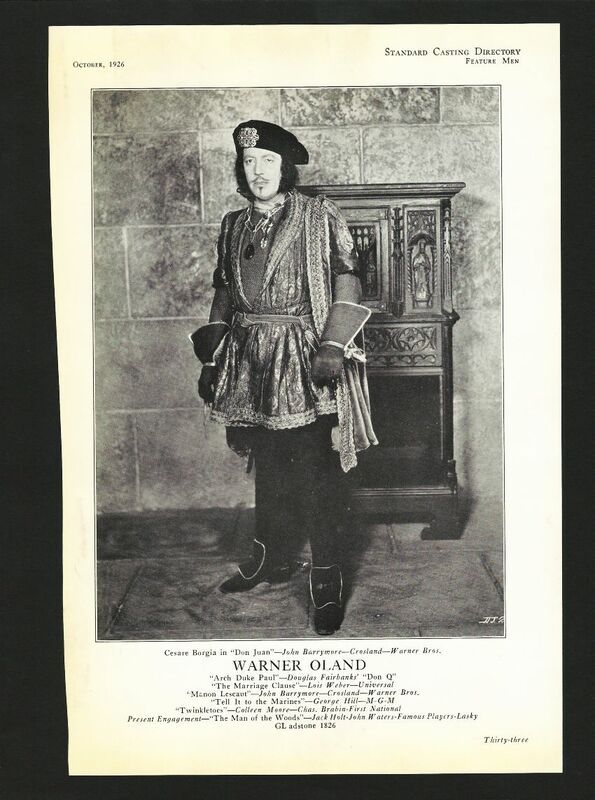 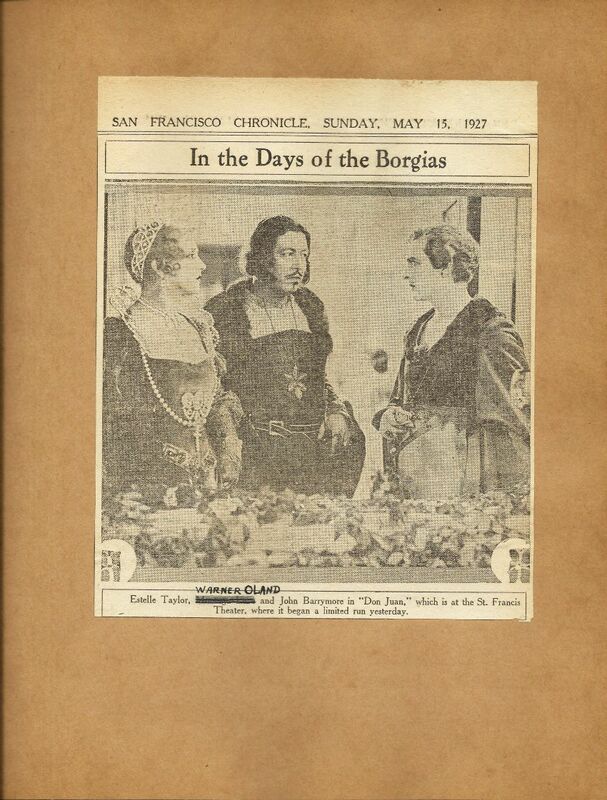 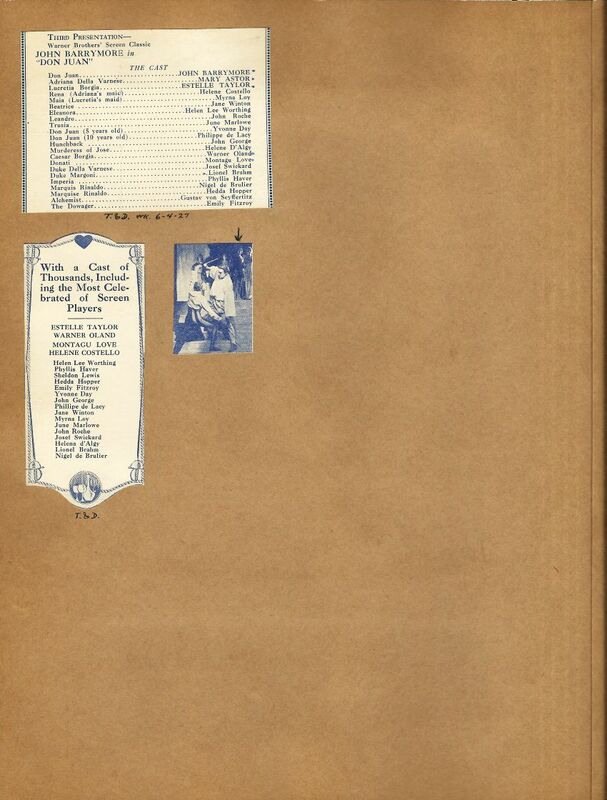 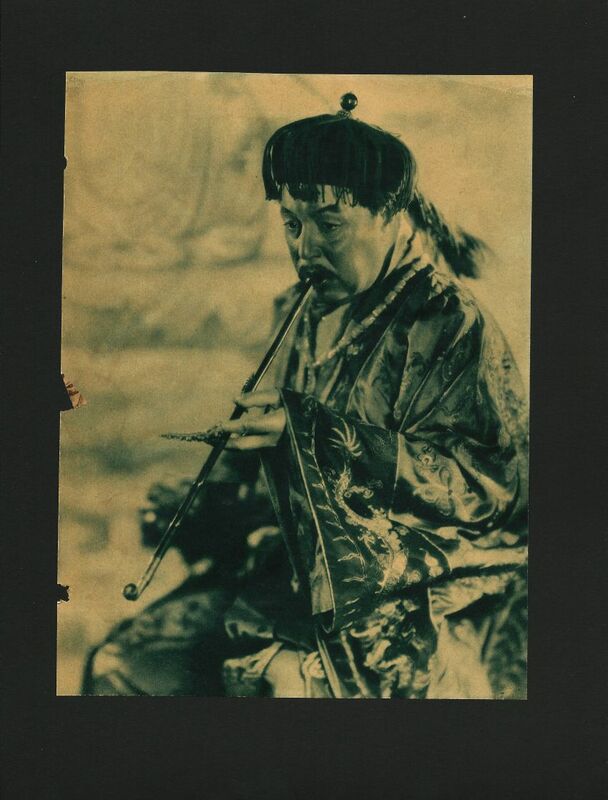 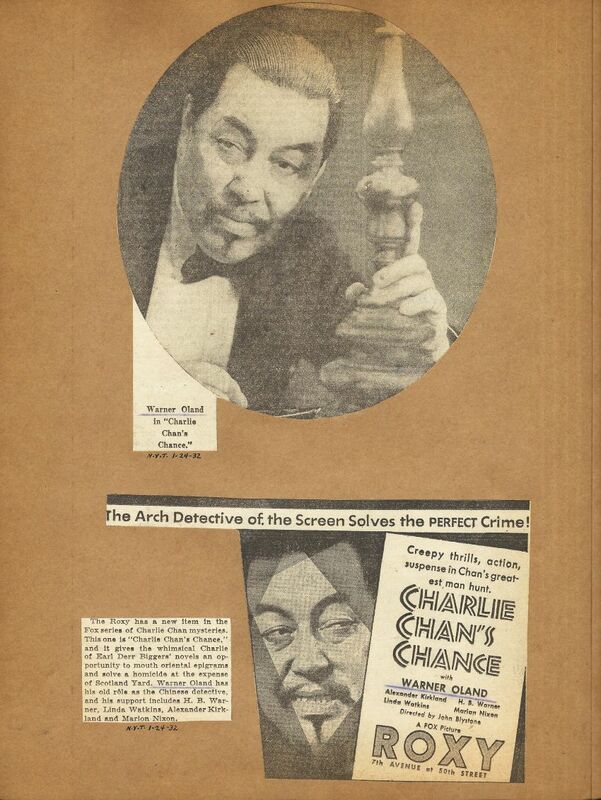 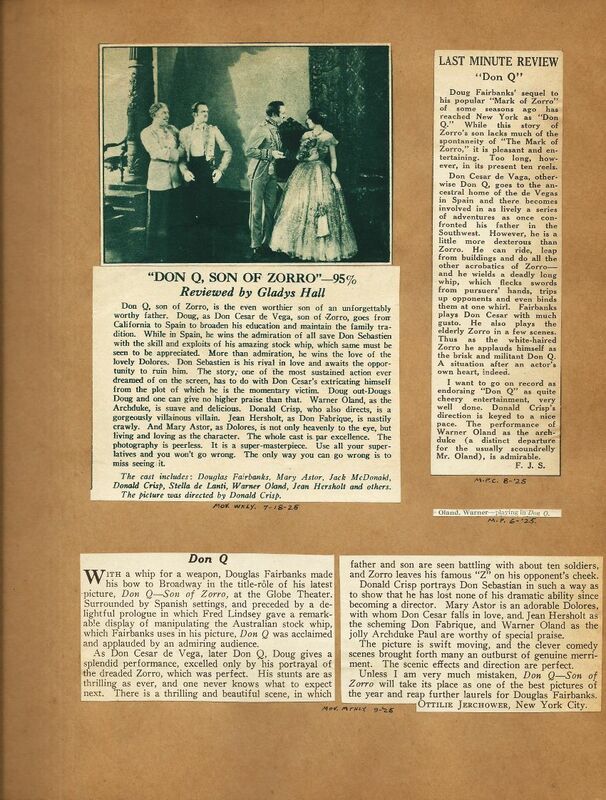 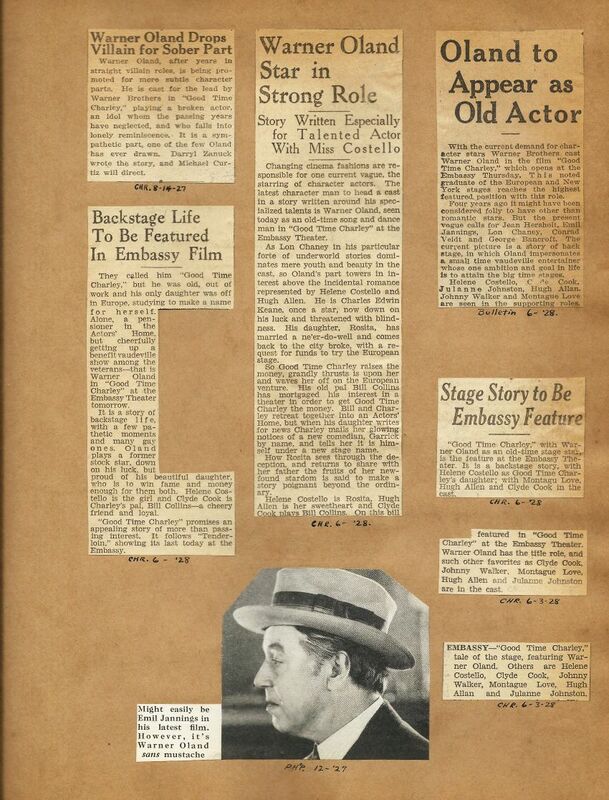 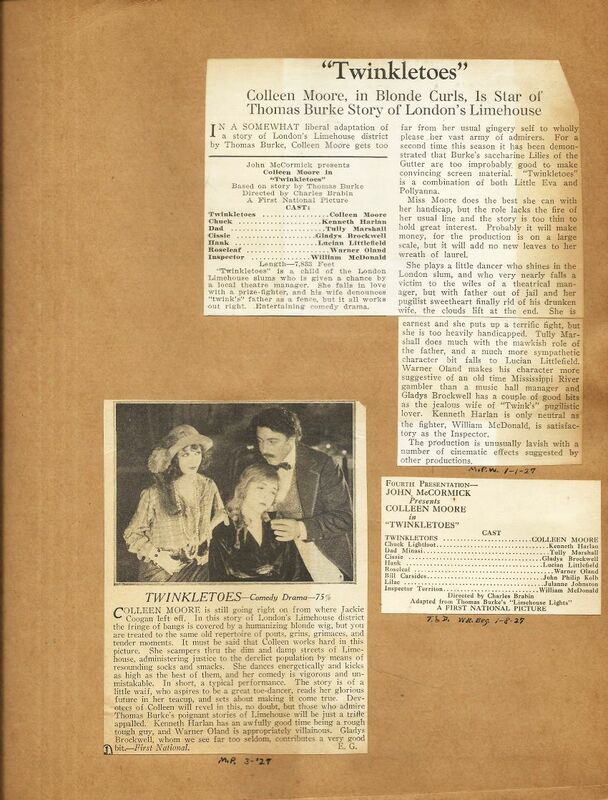 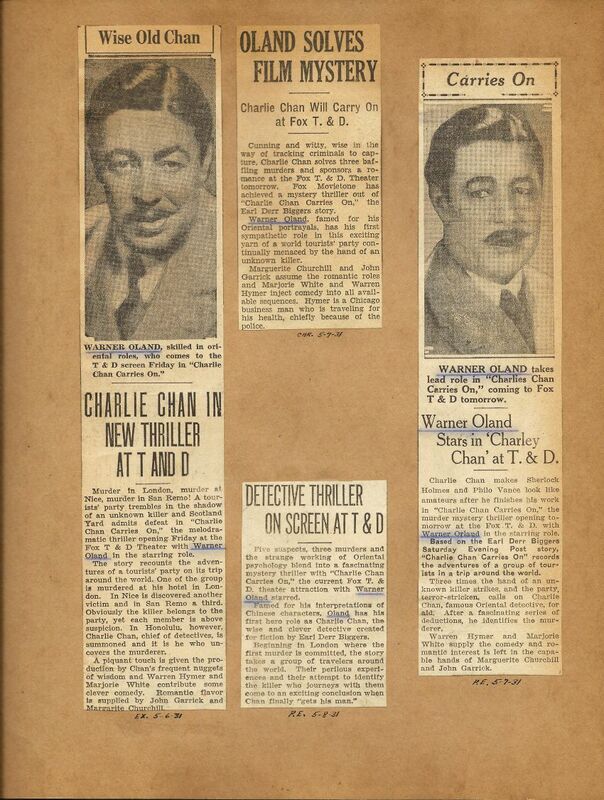 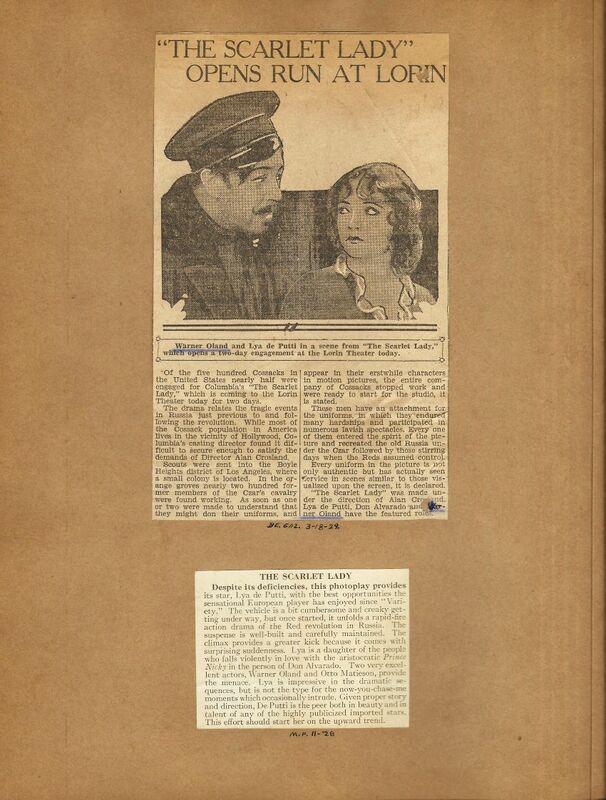 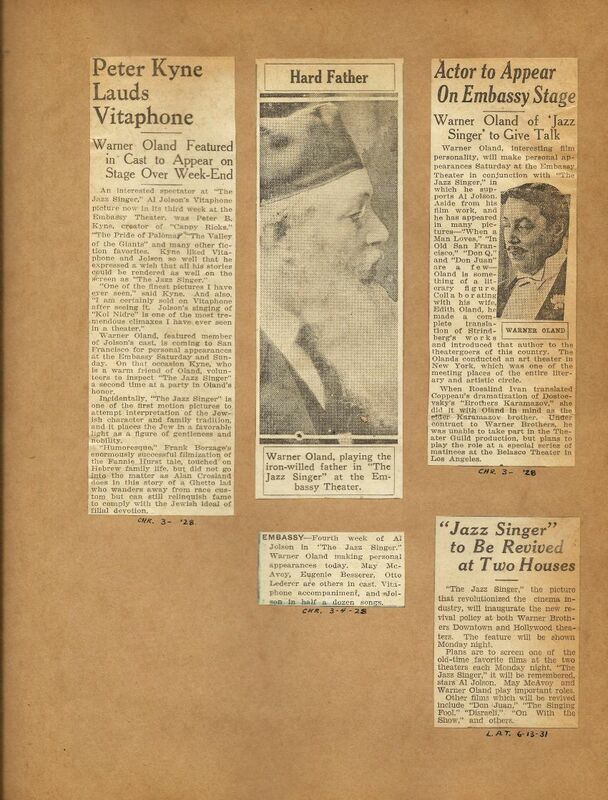 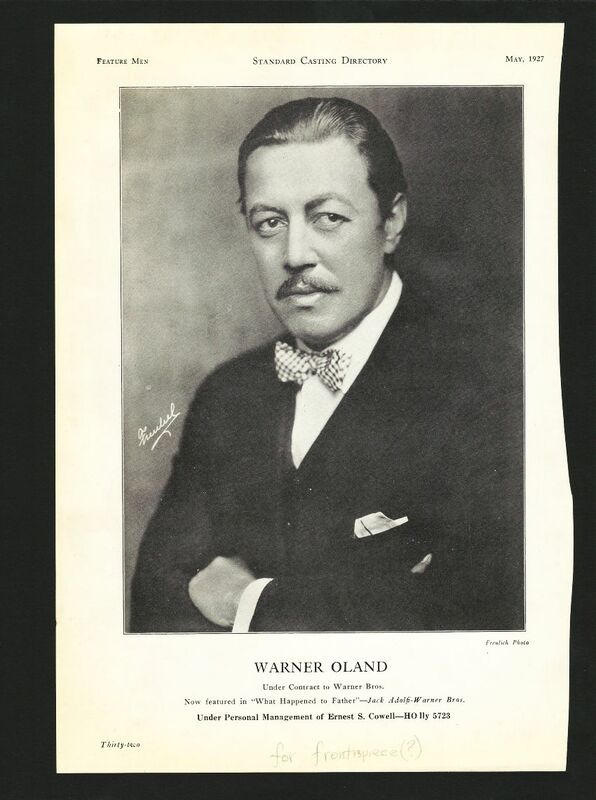 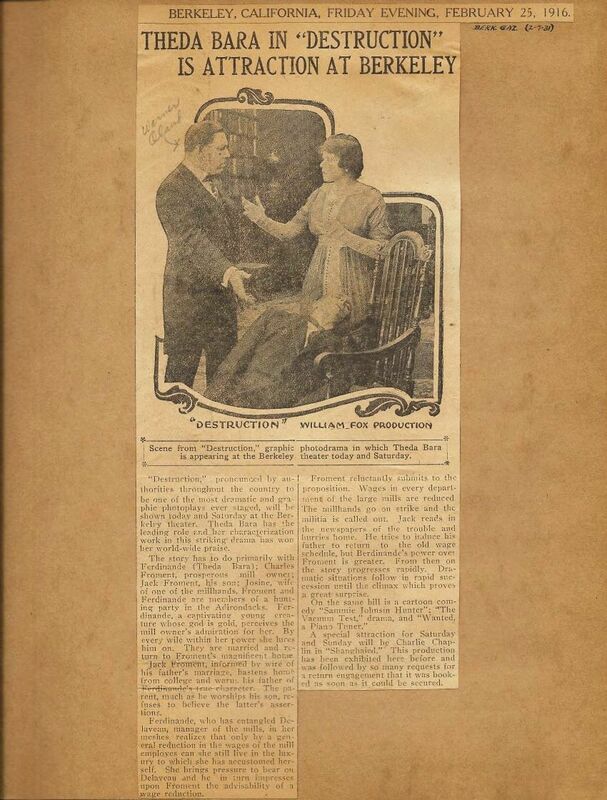 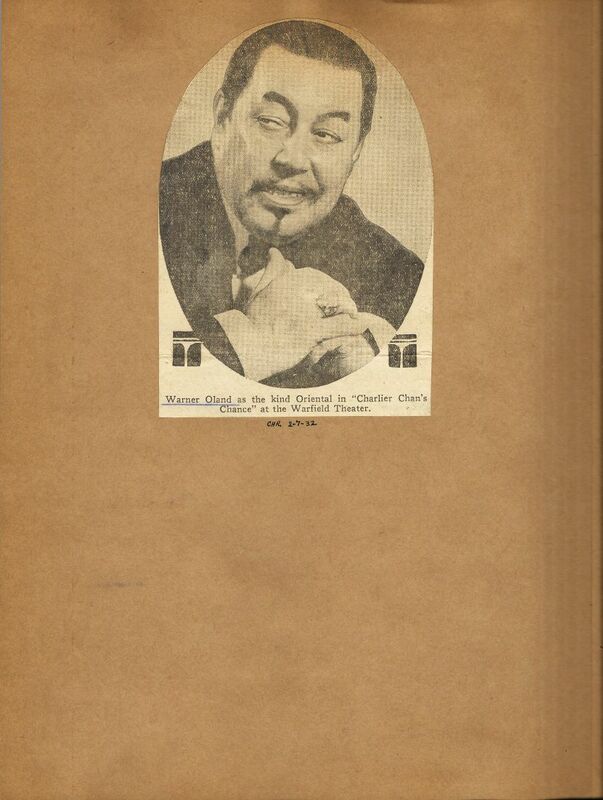 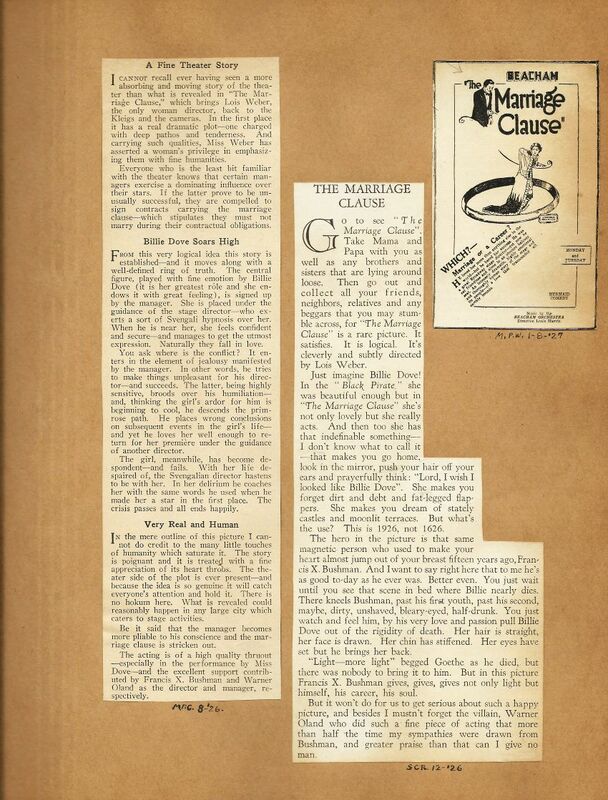 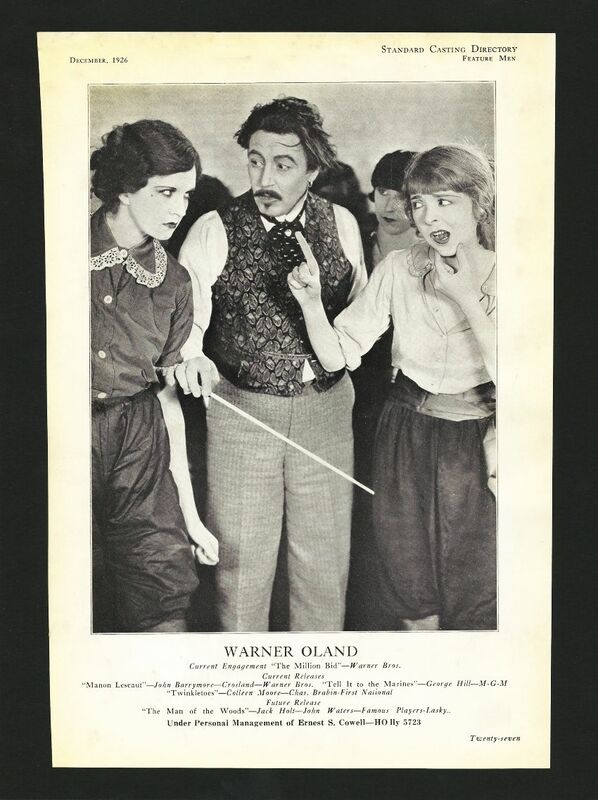 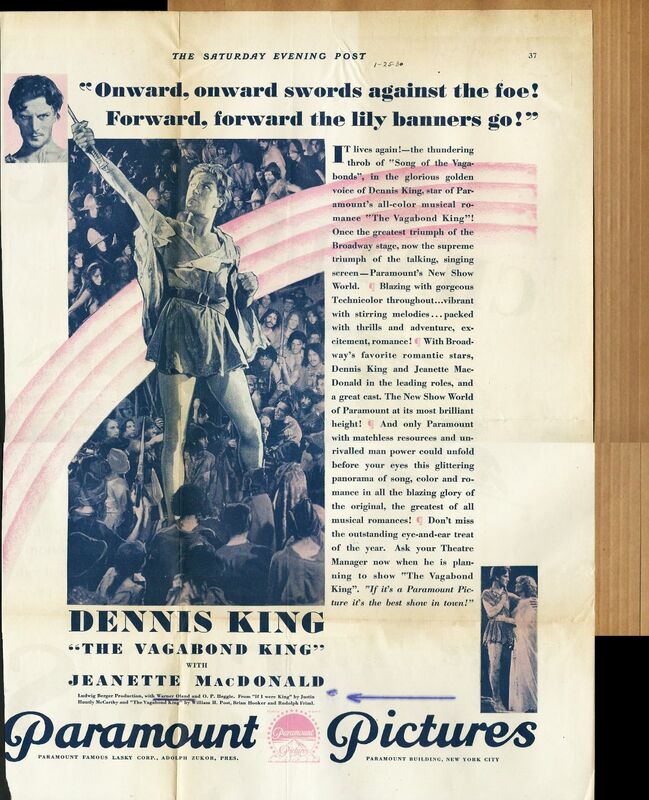 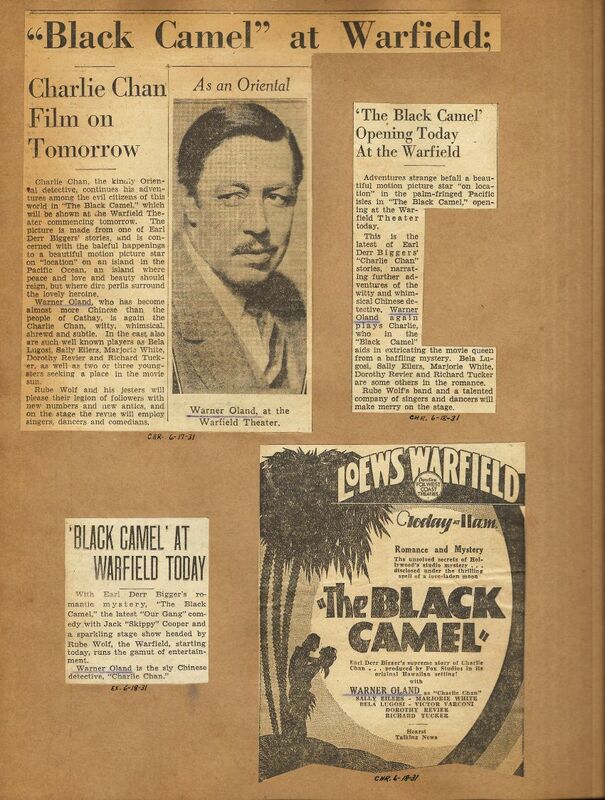 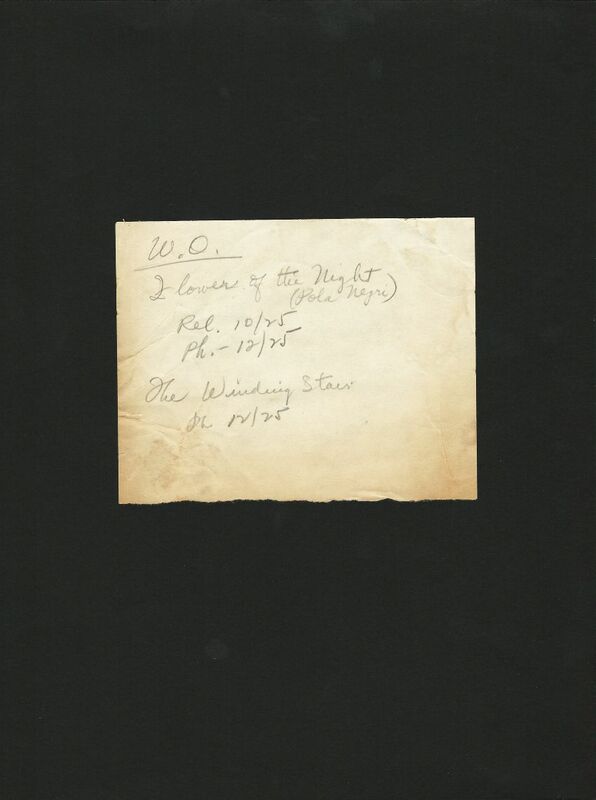 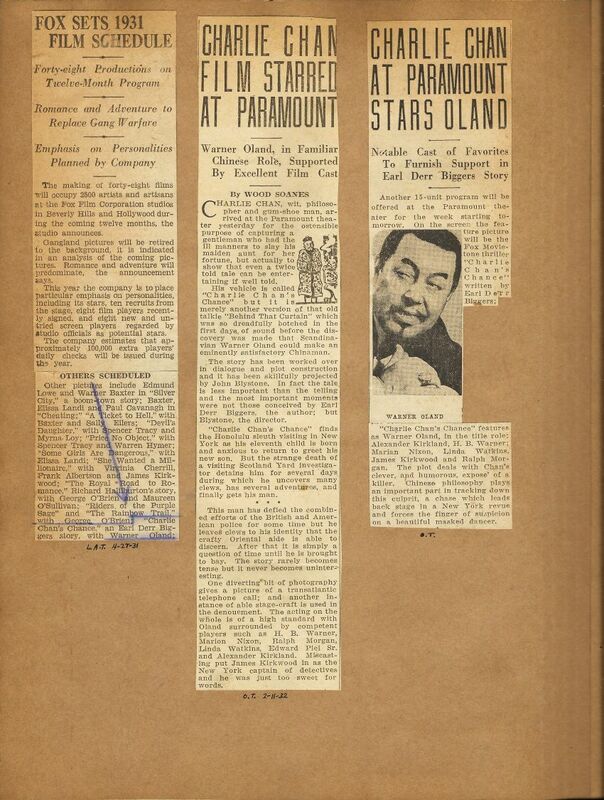 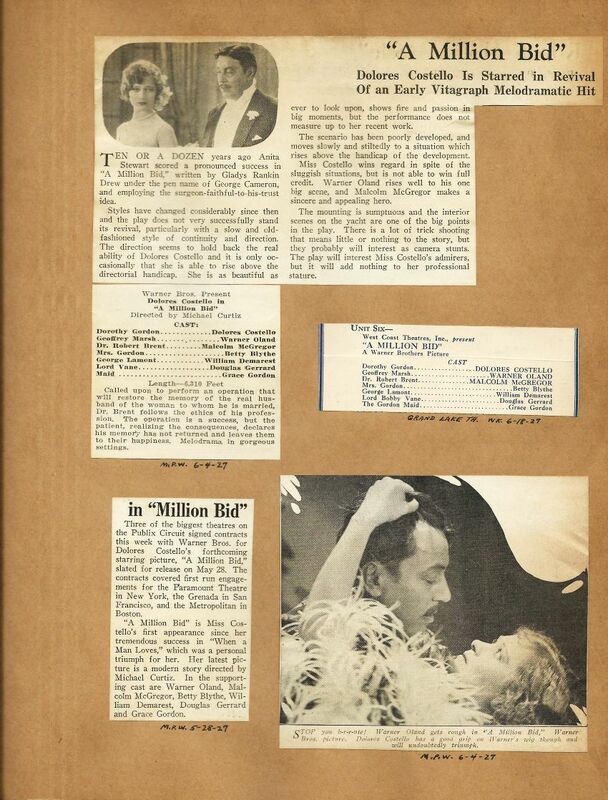 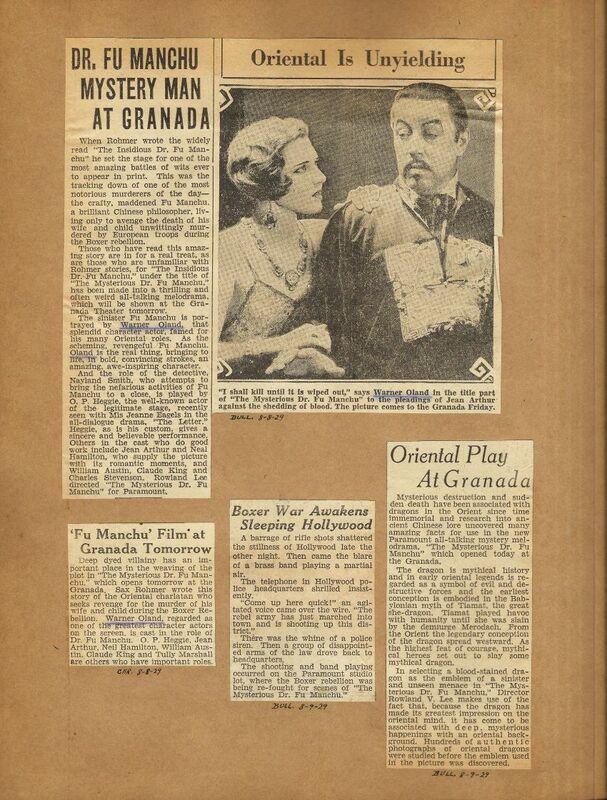 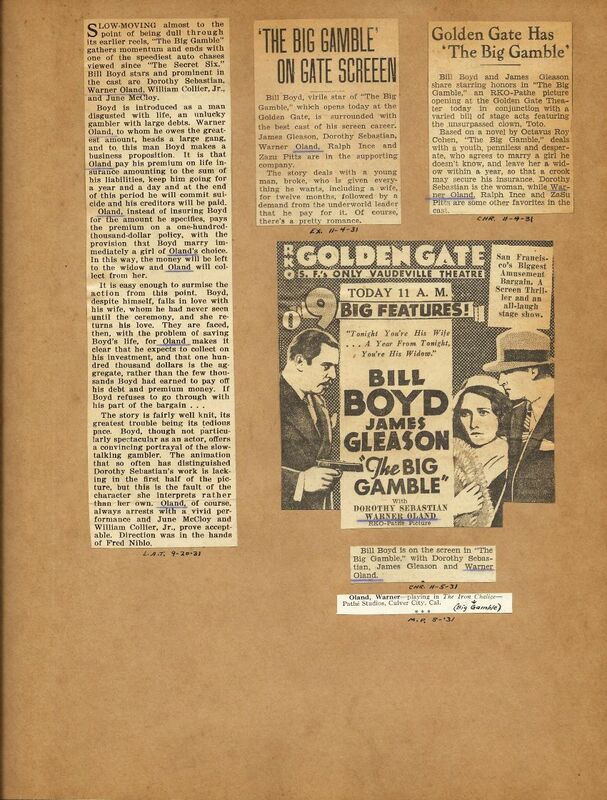 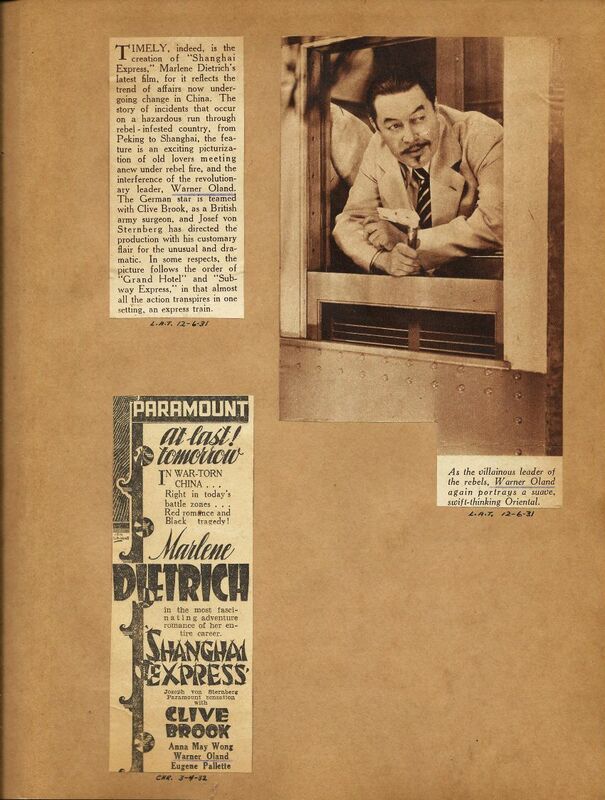 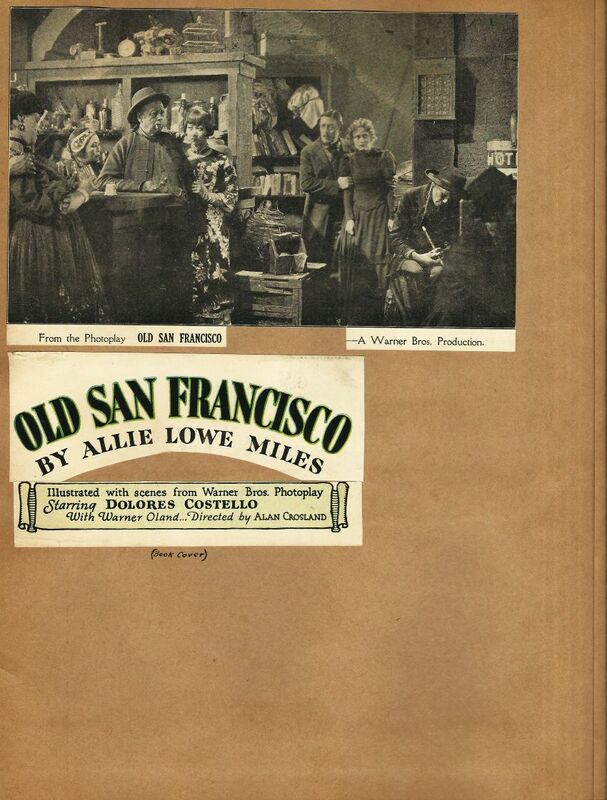 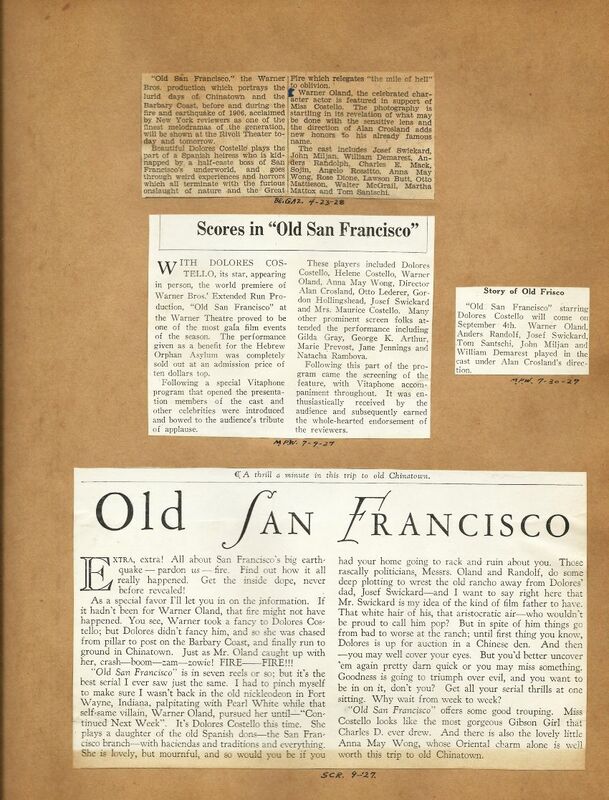 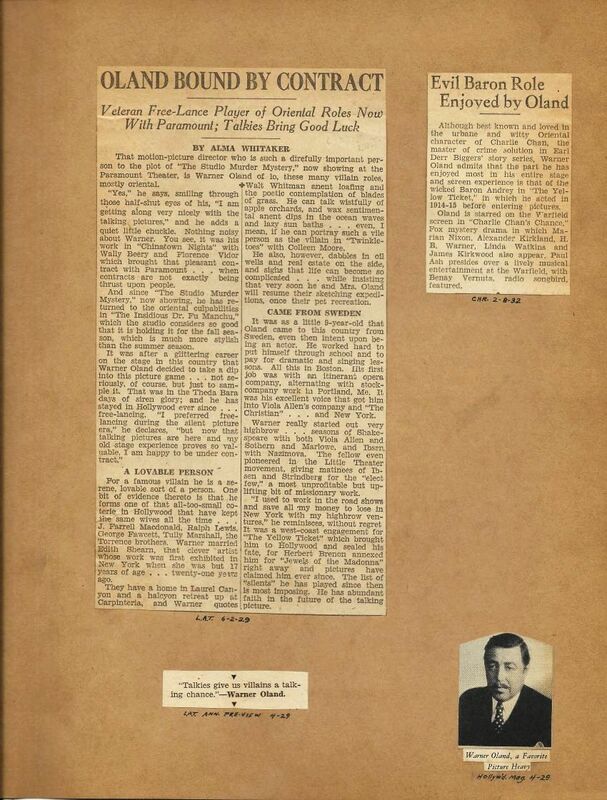 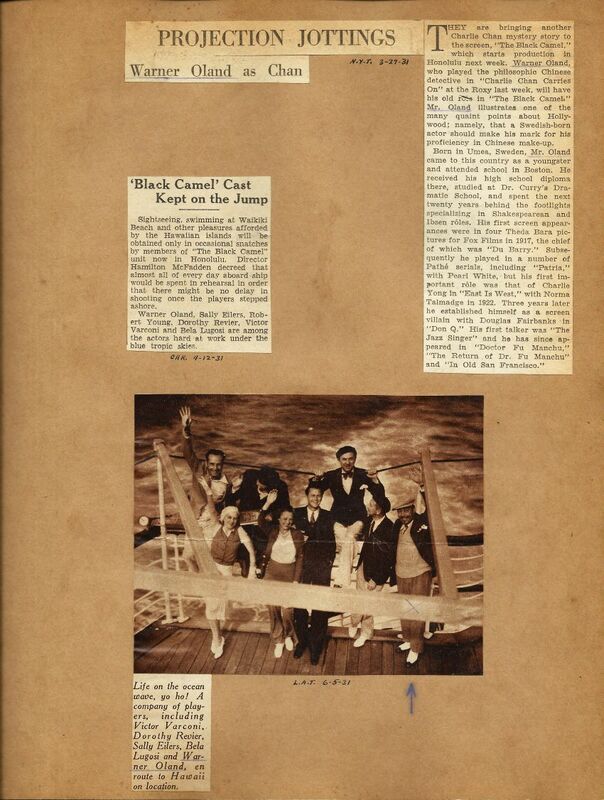 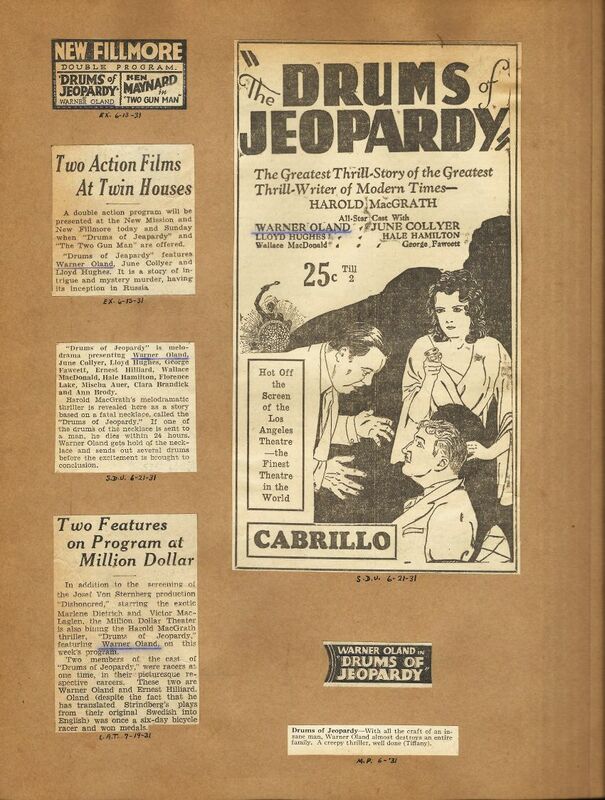 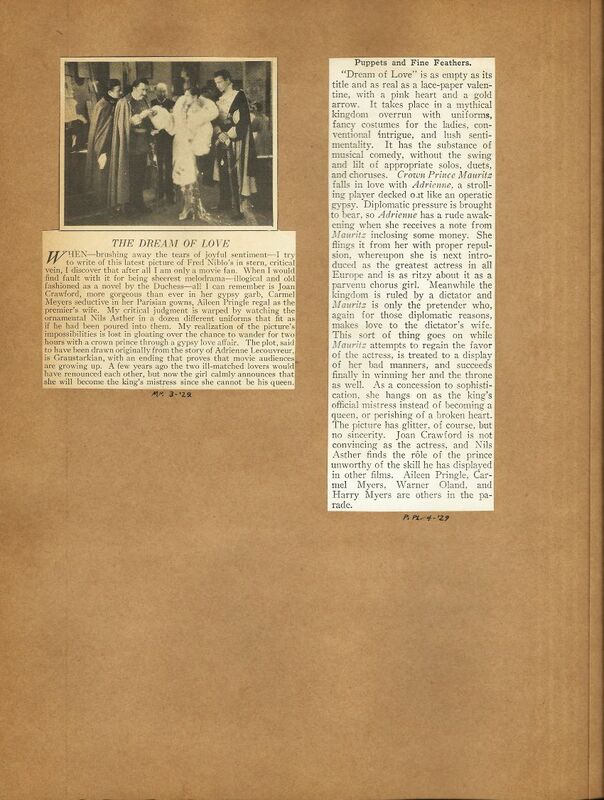 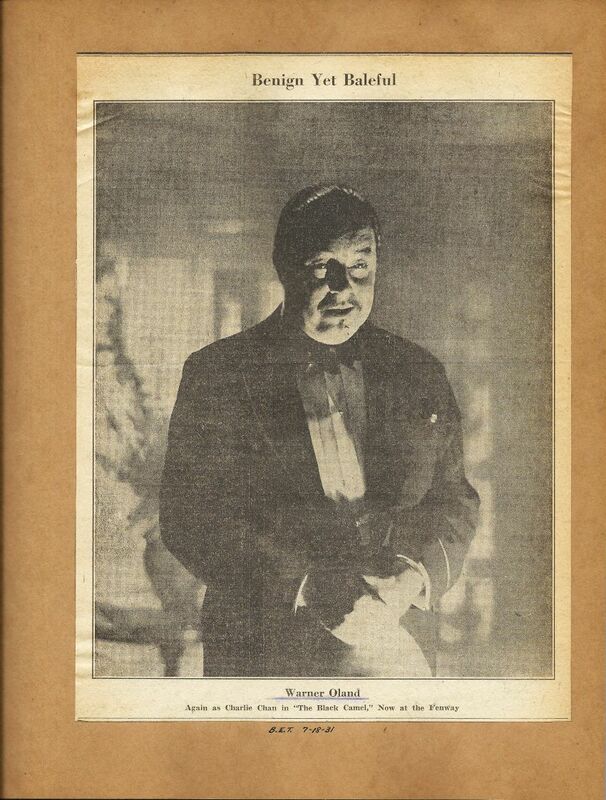 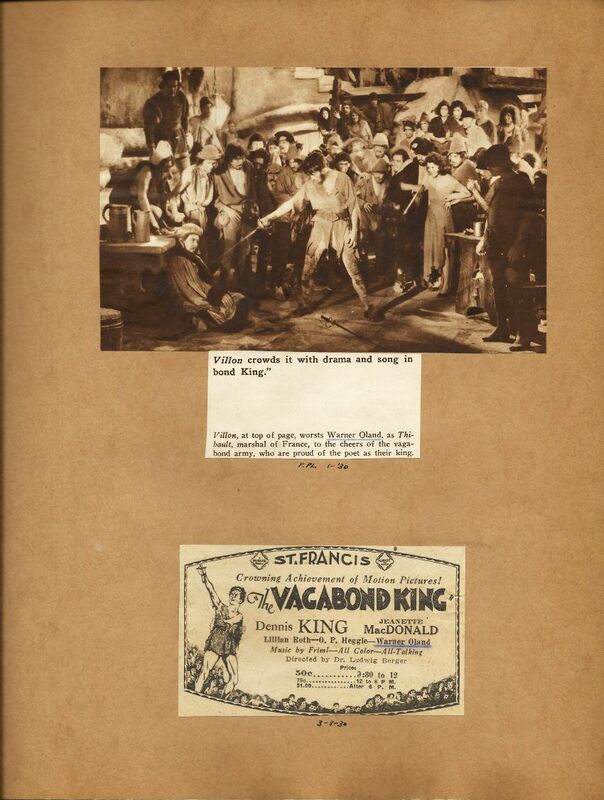 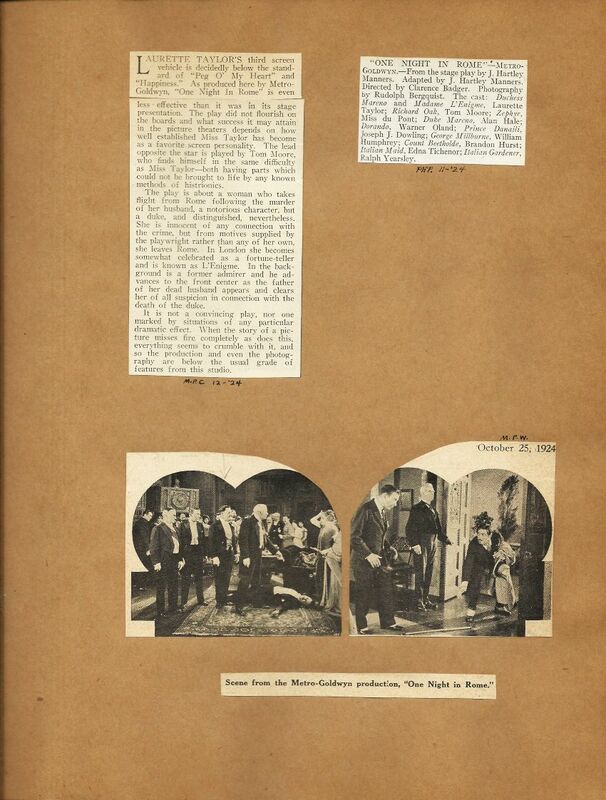 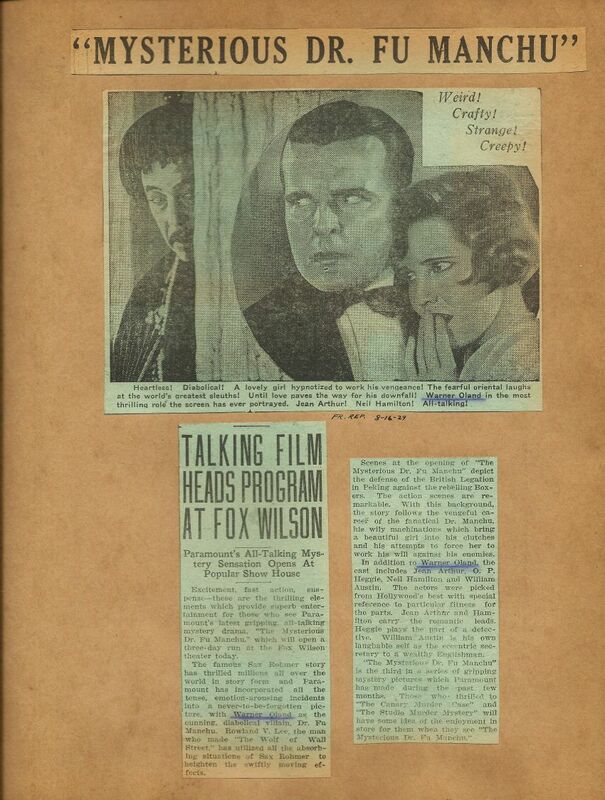 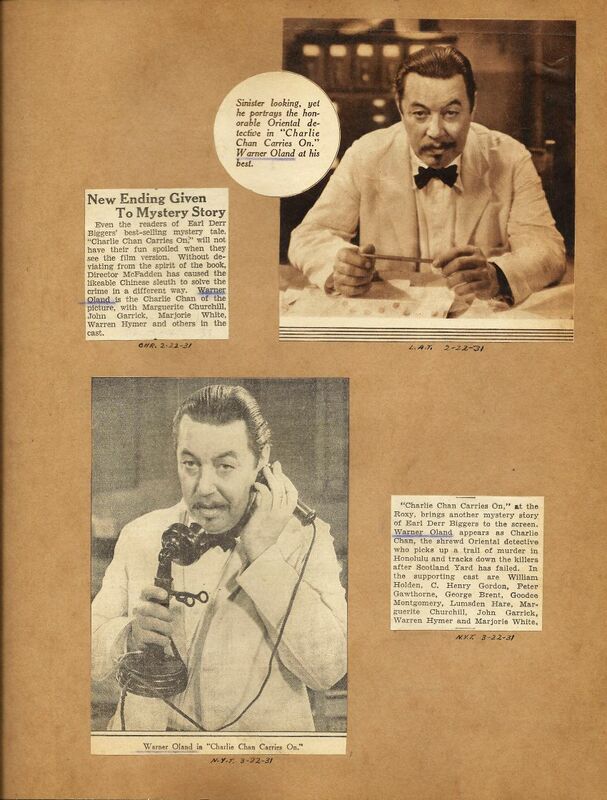 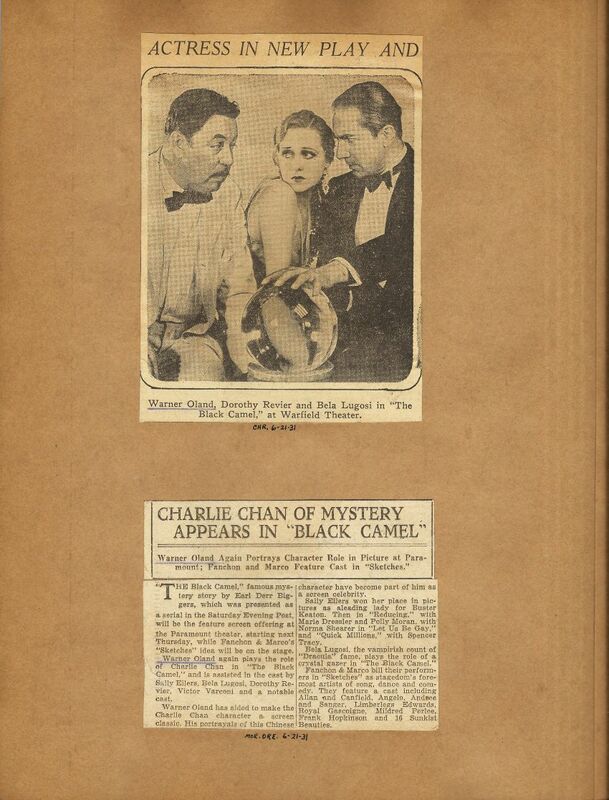 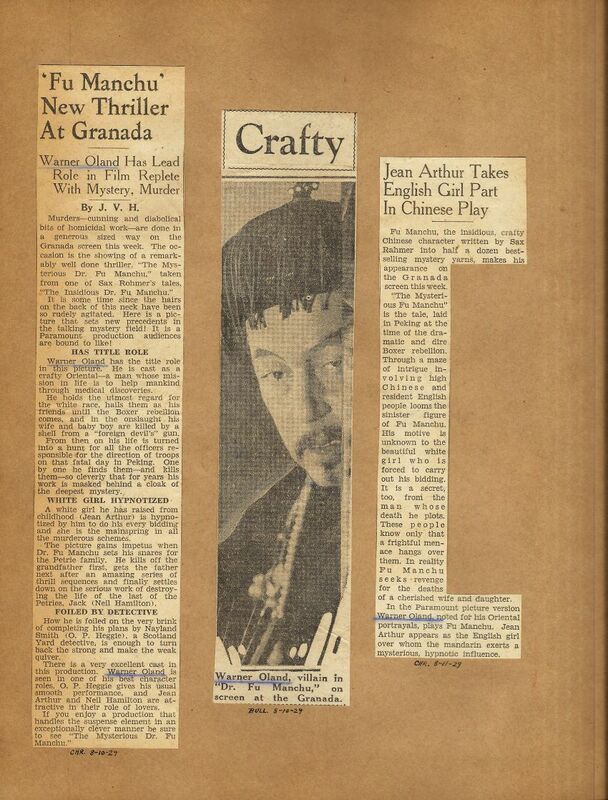 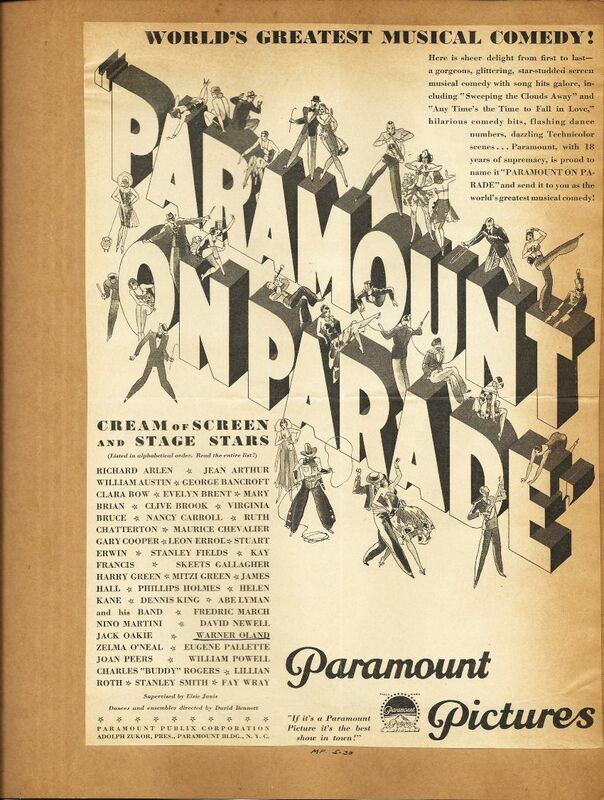 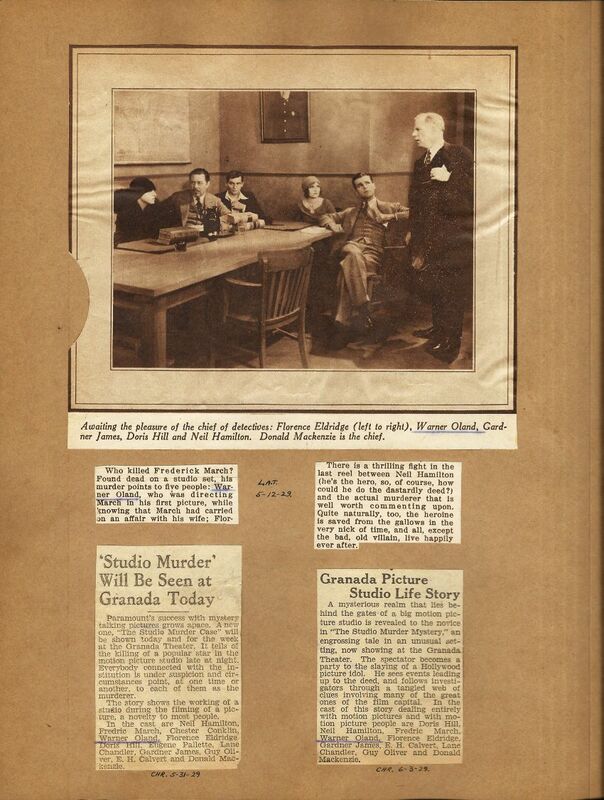 In closing, Mr. Charles Berry is to be thanked for his kindness and generosity which made it possible for us to obtain and now present the Warner Oland Scrap Book which is now available below for all to see.